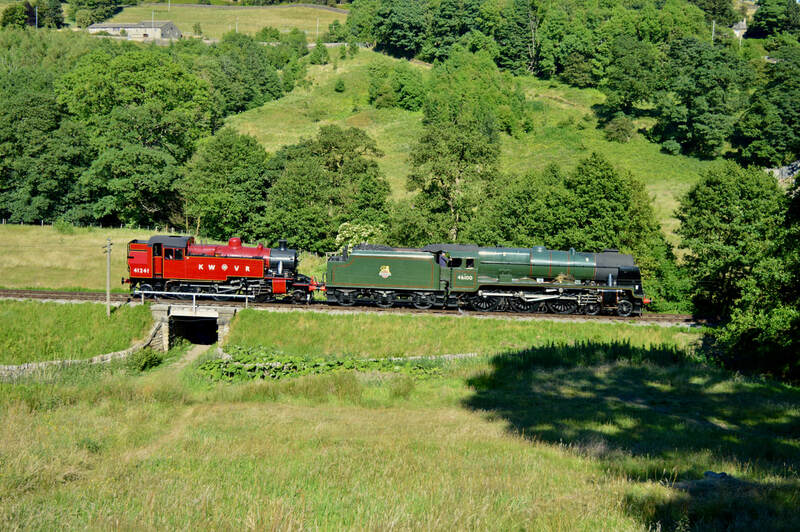 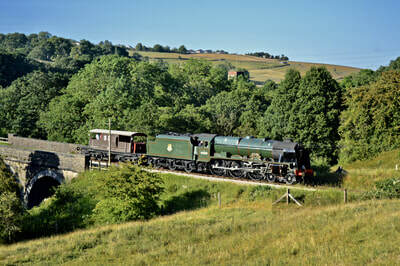 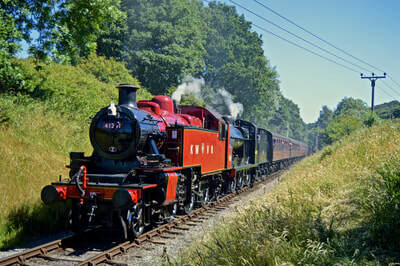 August Bank Holiday Sunday saw a two locos in steam service in operation on the Worth Valley. S160 5820 'Big Jim' was operating the main set consisting of a Mk1 corridor rake, while the second set was formed of the White Rose Pullman carriages and 3 Suburban Mk1's hauled by Standard 4MT 75078. 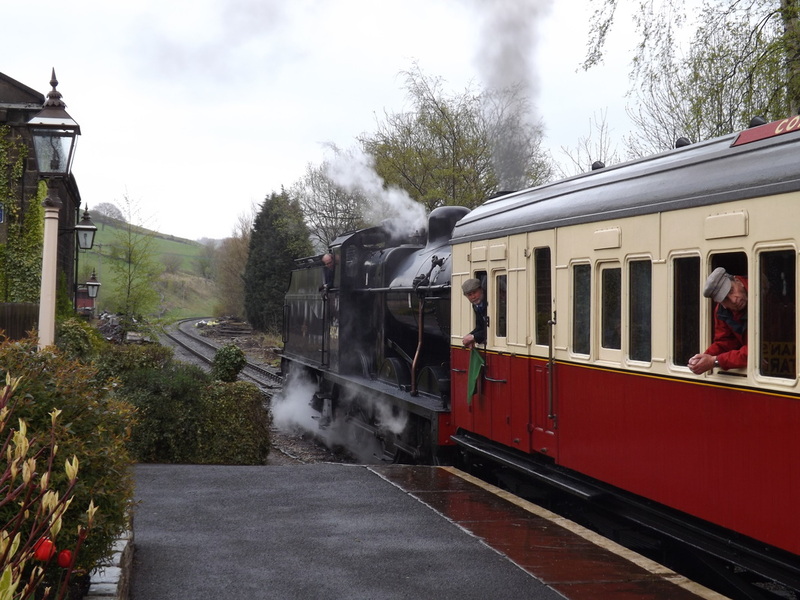 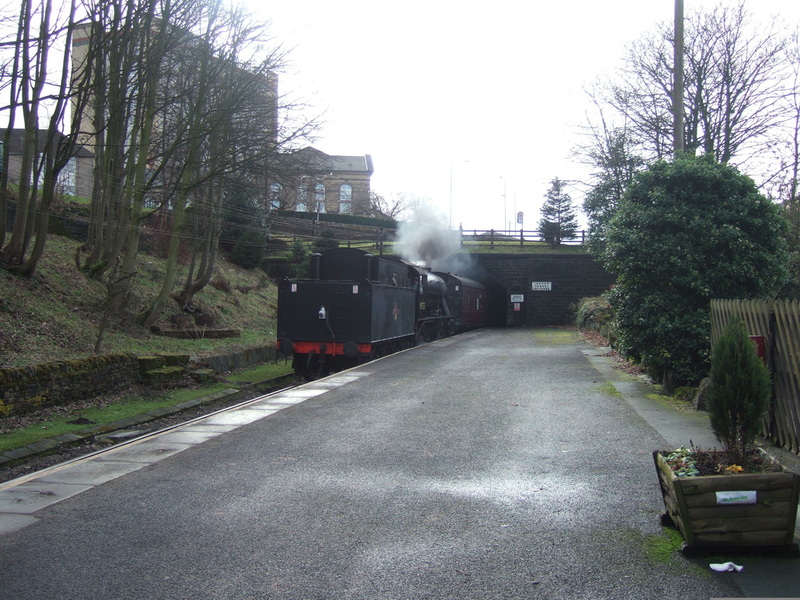 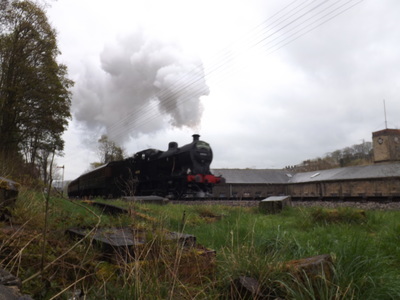 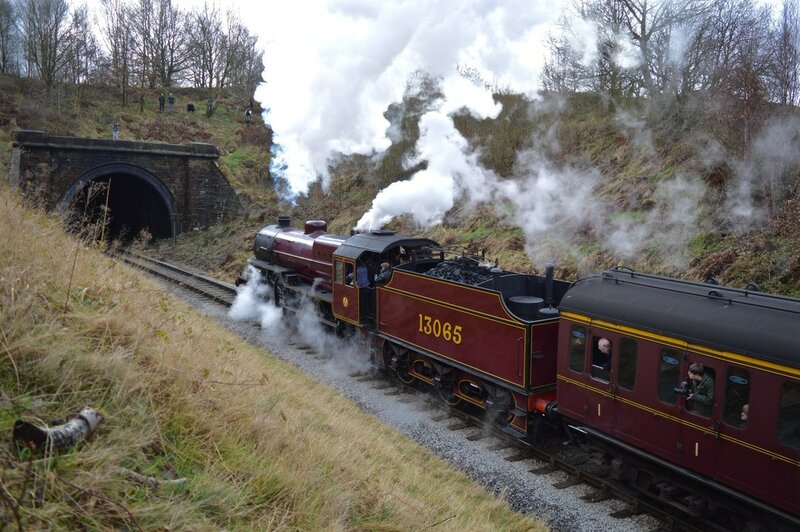 My video starts on the approach to Mytholmes Tunnels with the S160 on the 16:15 service for Oxenhope. 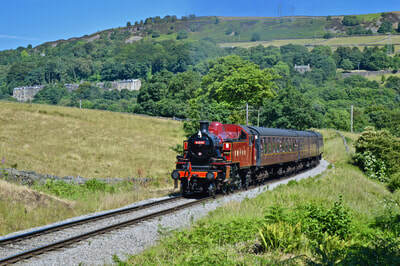 Next shot we see 75078 on the outskirts of Howarth on the climb to Oxenhope with the 15:30, followed by its departure from Keighley with the 14:00. 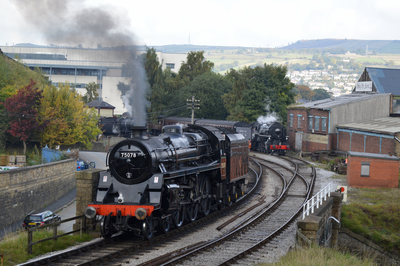 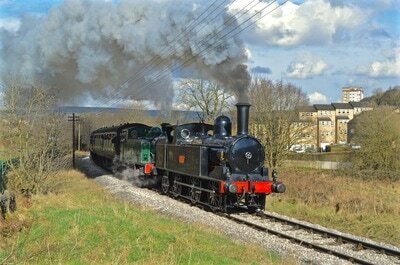 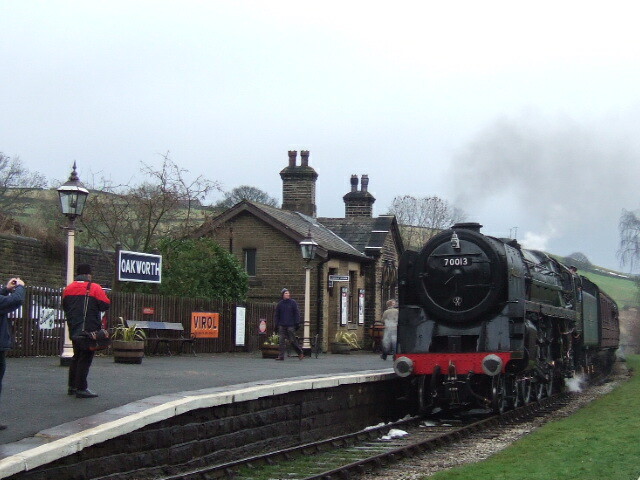 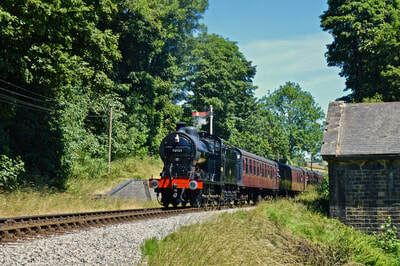 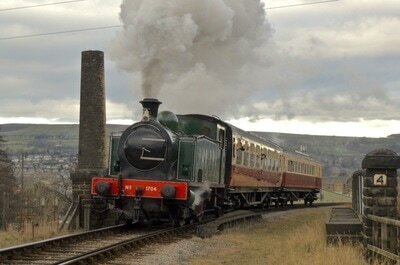 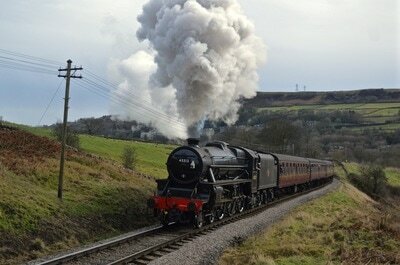 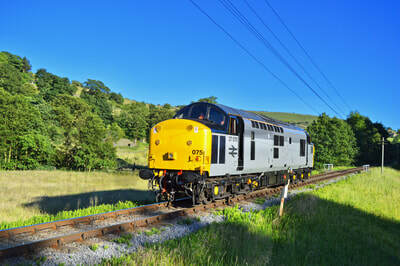 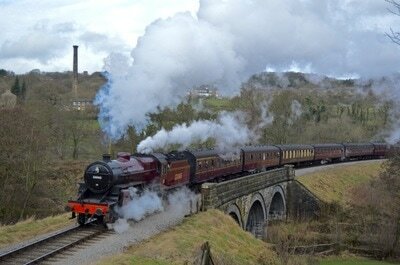 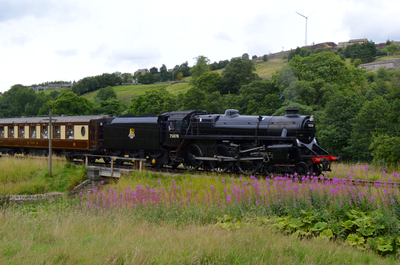 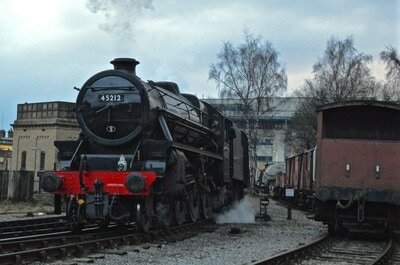 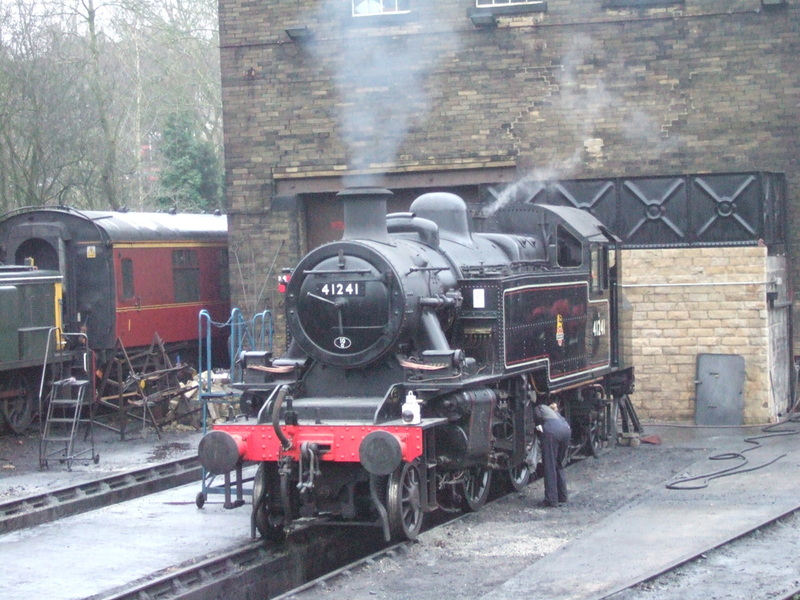 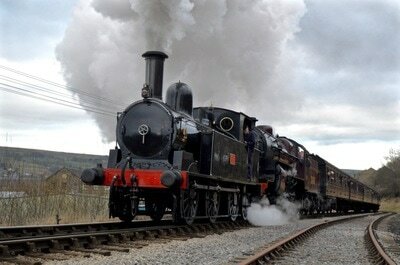 The 17:00 from Keighley arriving into Howarth is our next shot, featuring the 4MT again. 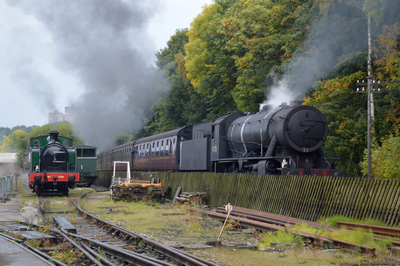 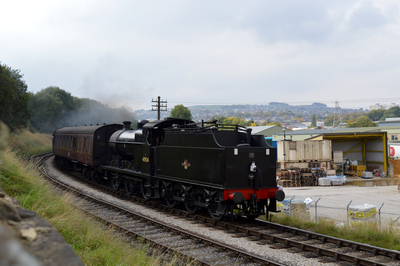 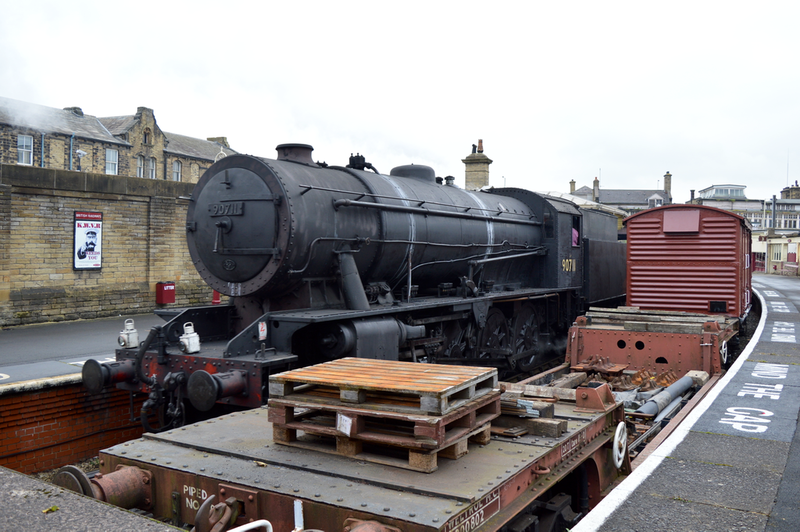 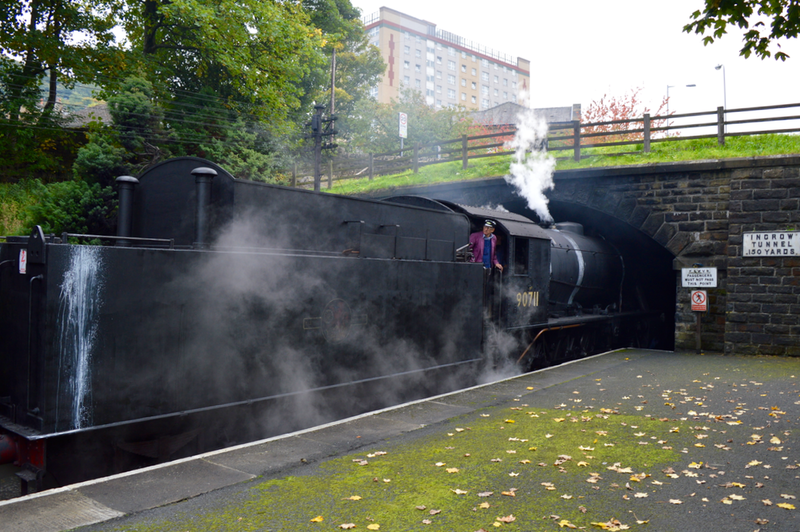 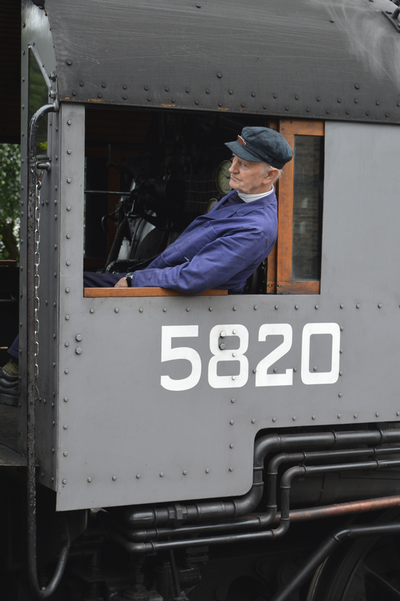 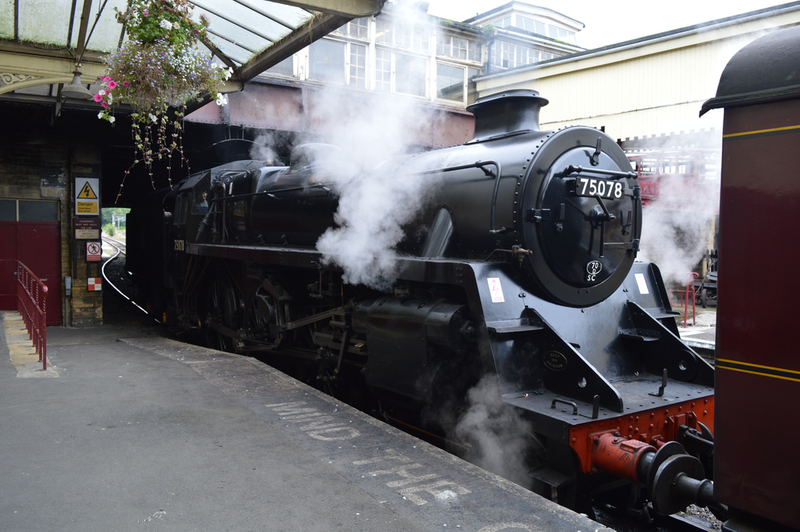 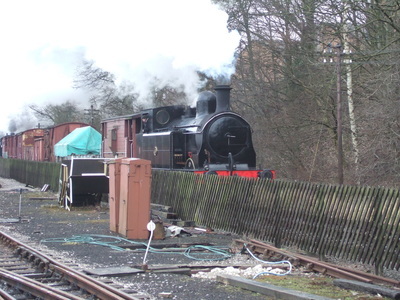 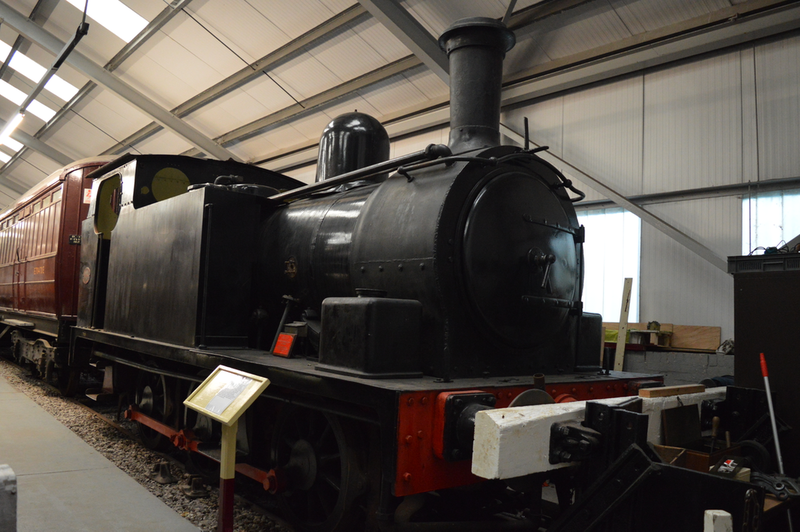 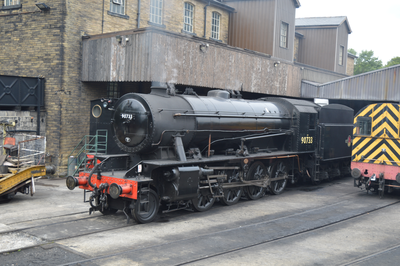 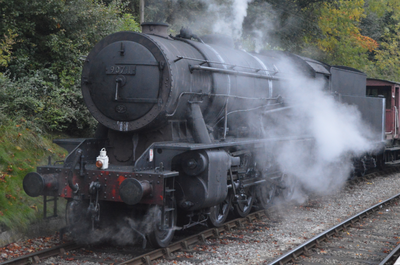 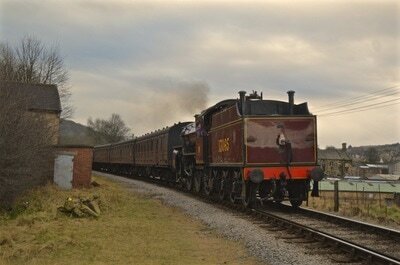 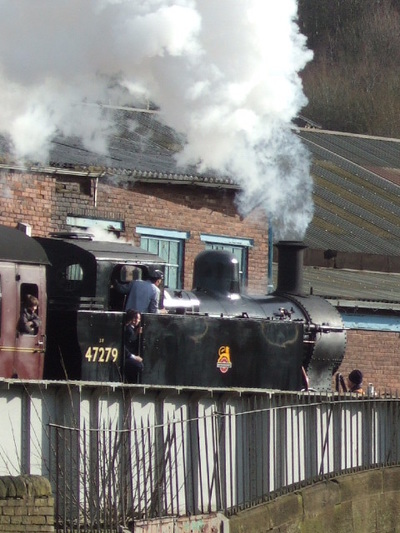 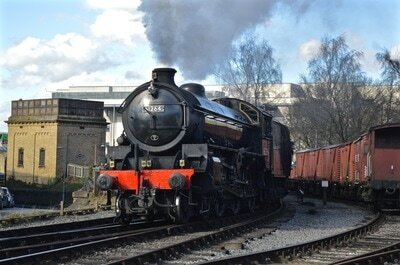 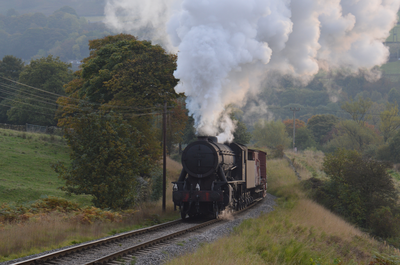 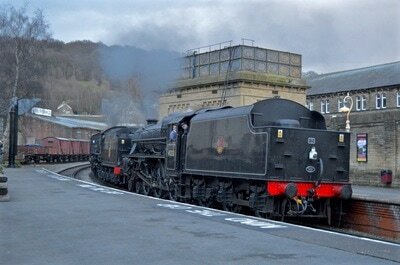 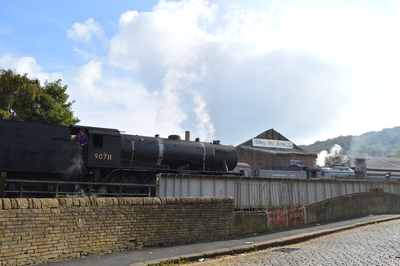 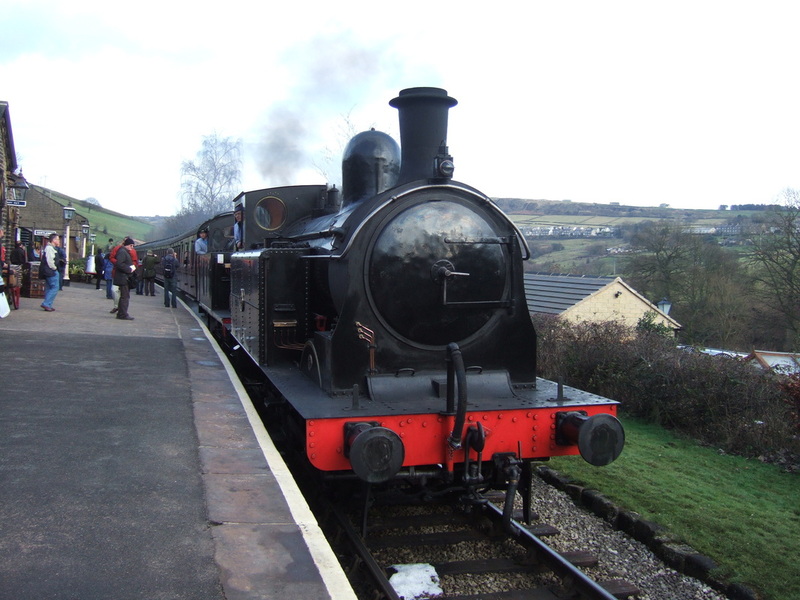 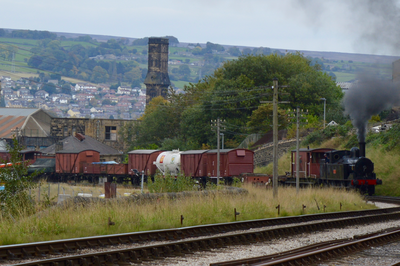 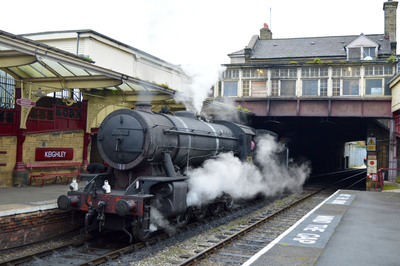 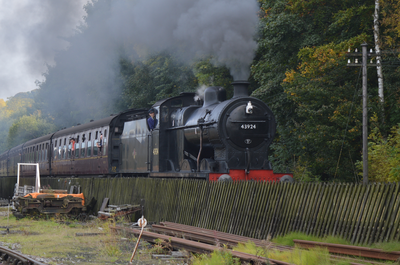 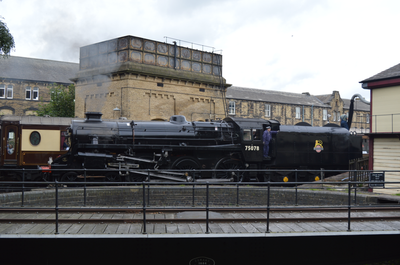 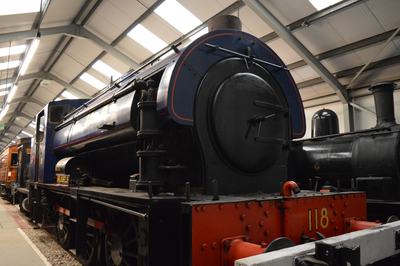 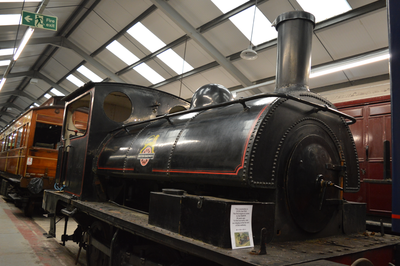 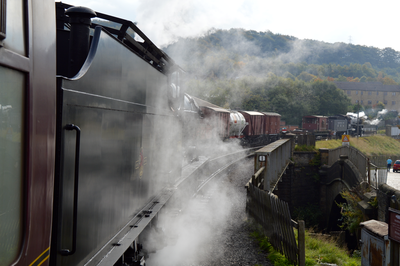 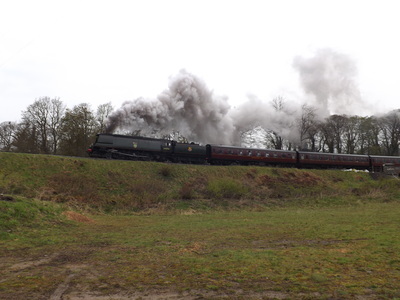 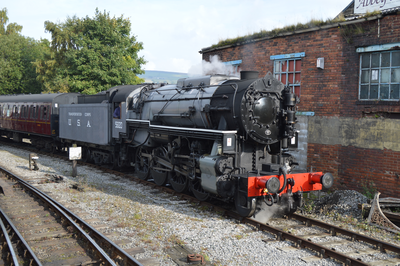 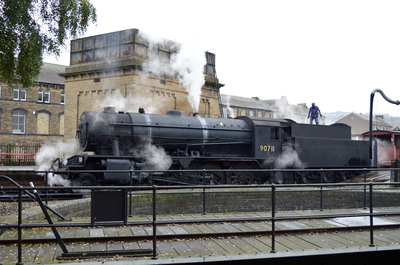 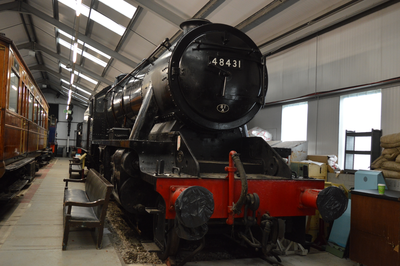 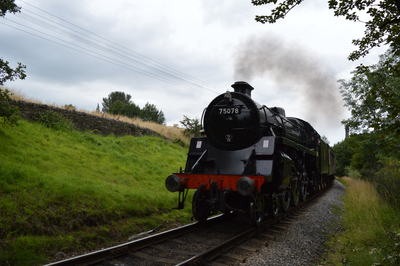 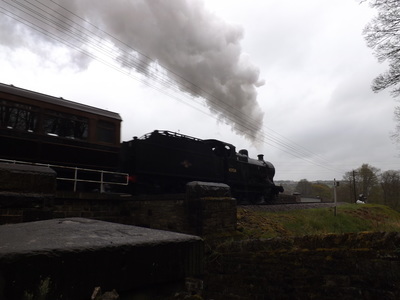 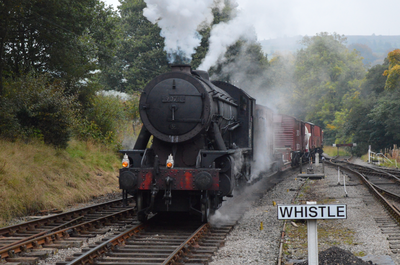 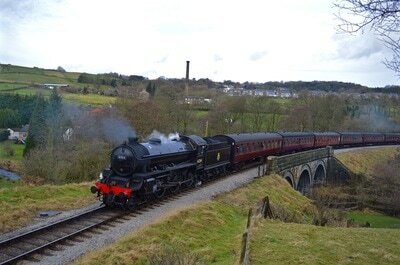 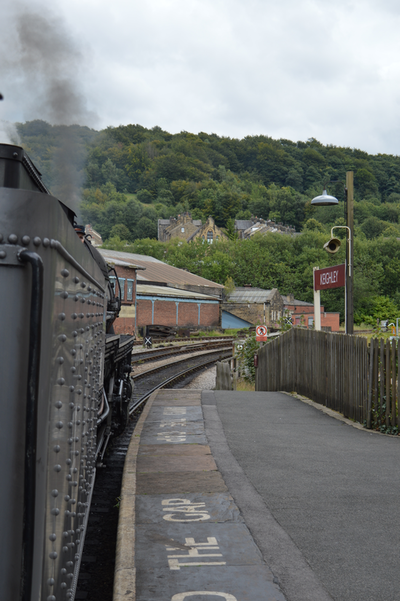 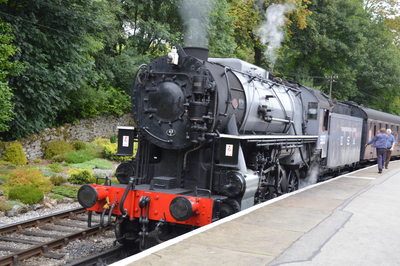 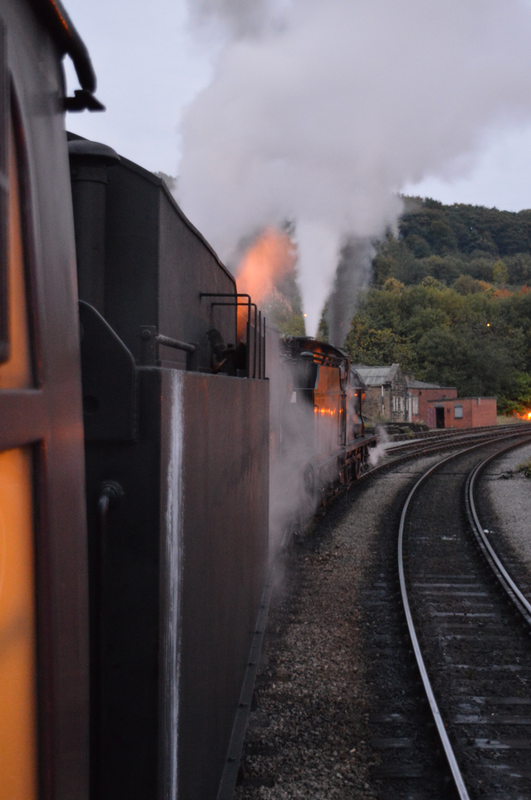 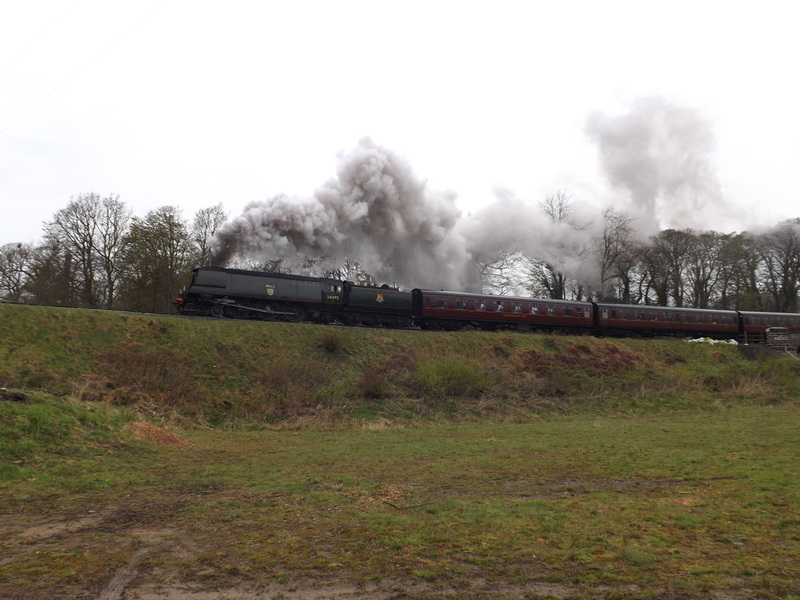 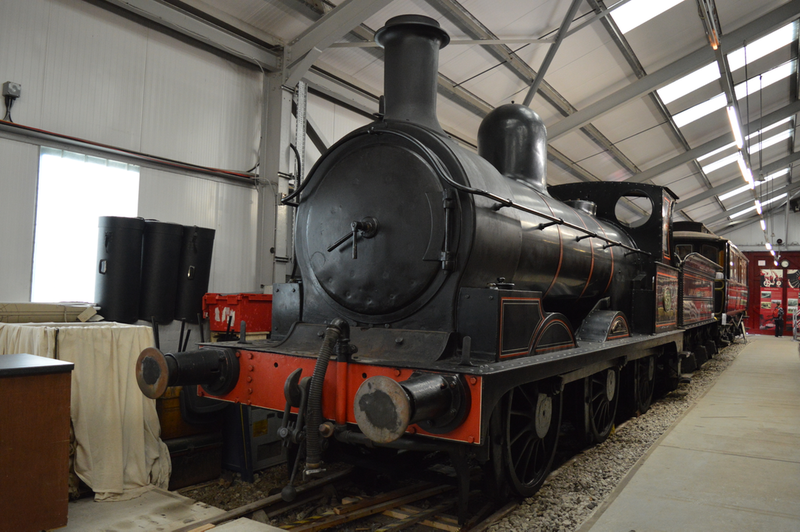 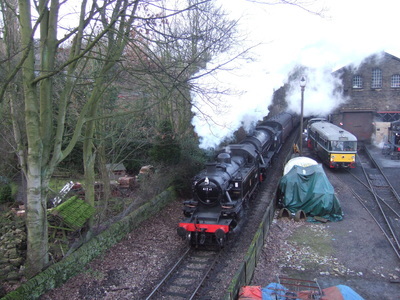 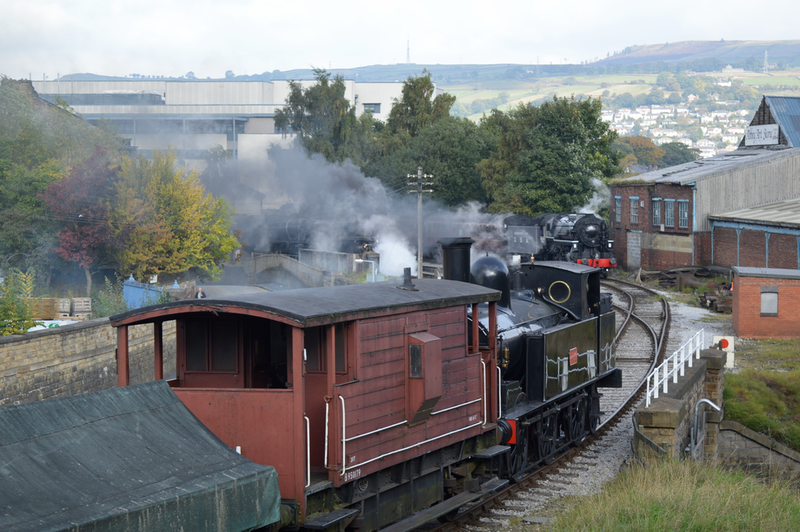 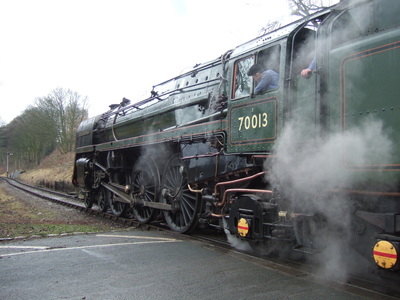 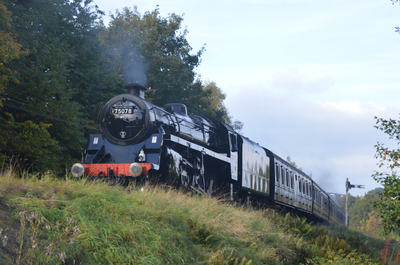 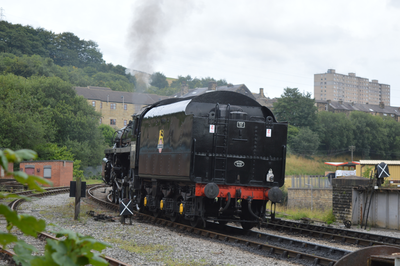 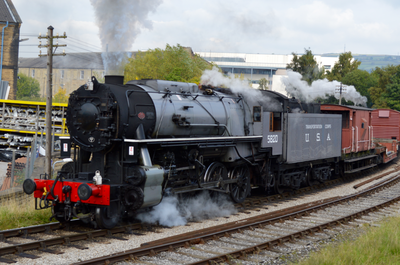 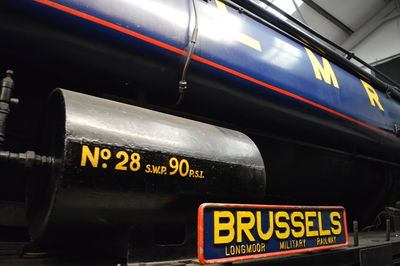 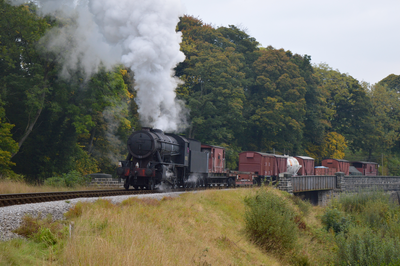 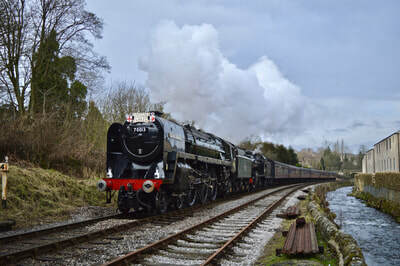 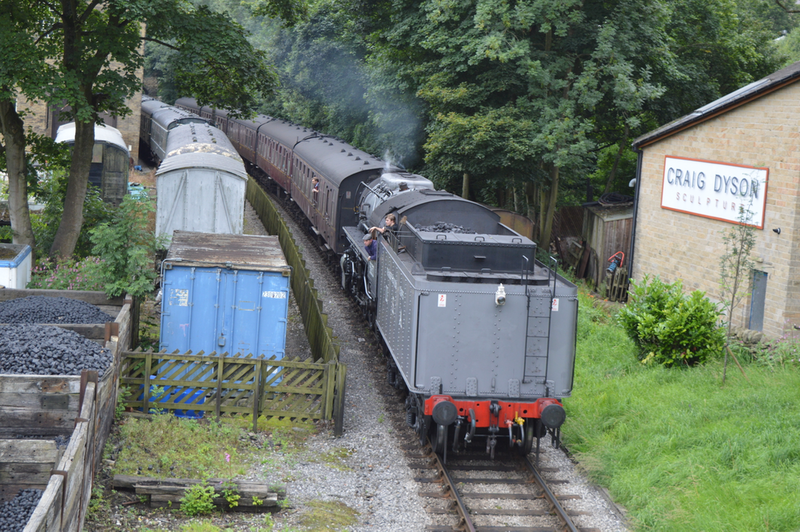 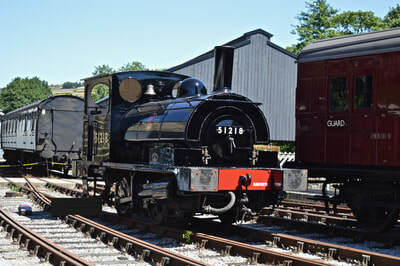 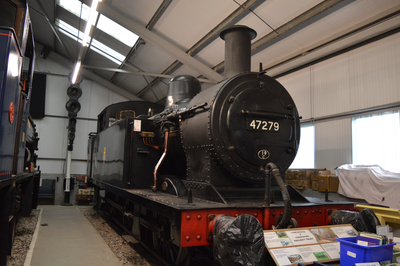 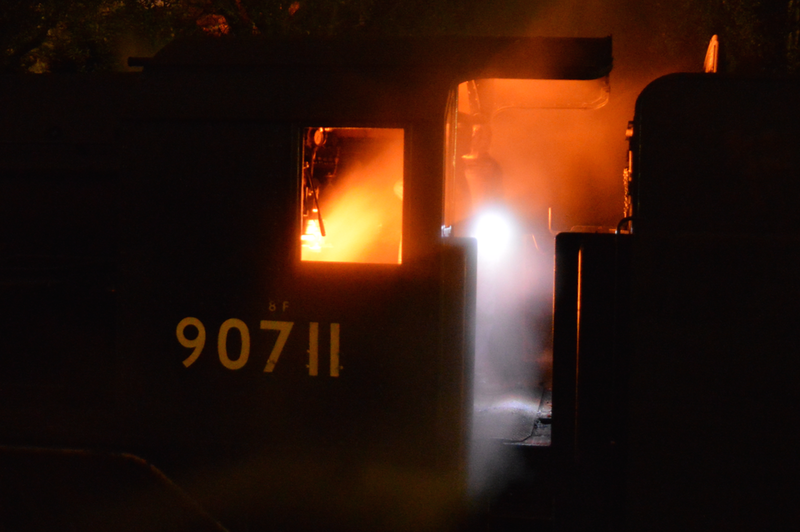 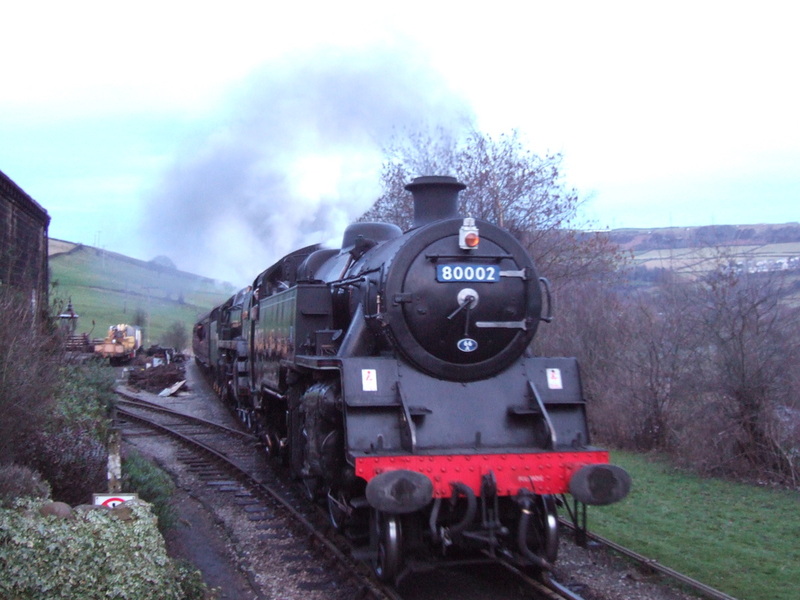 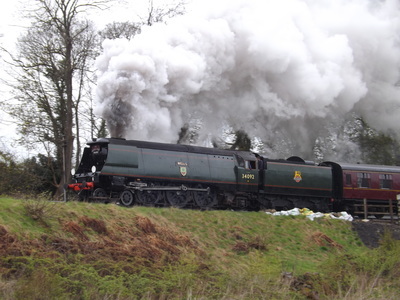 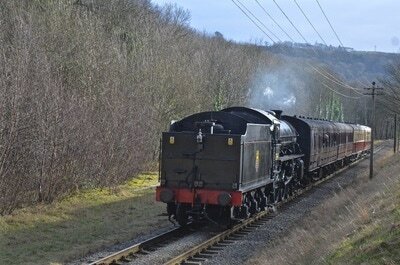 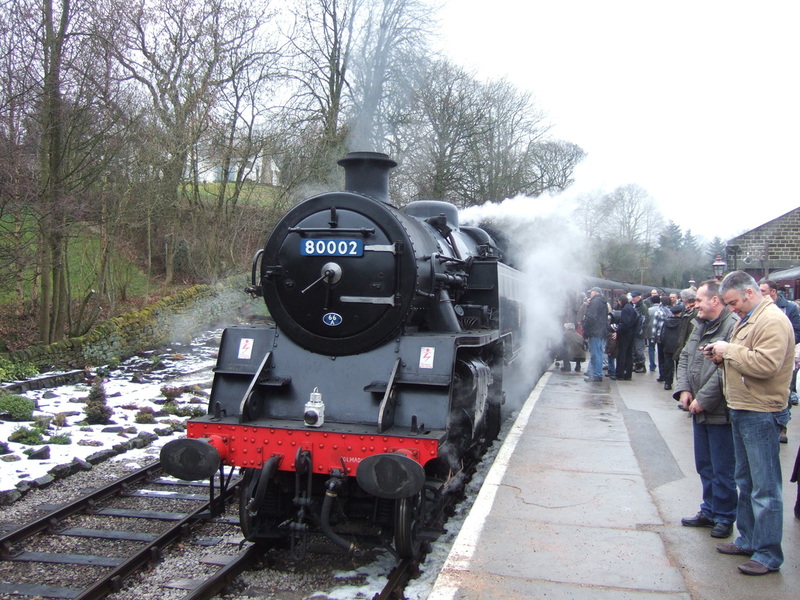 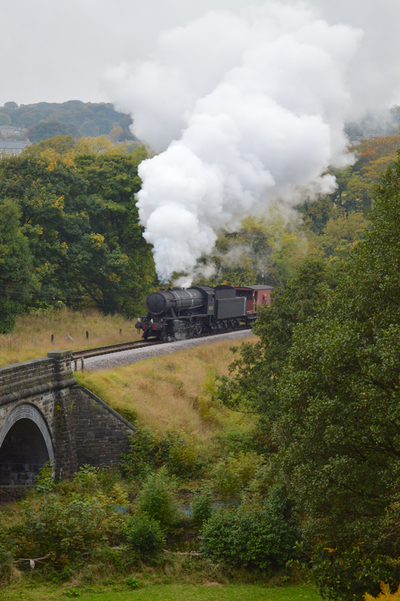 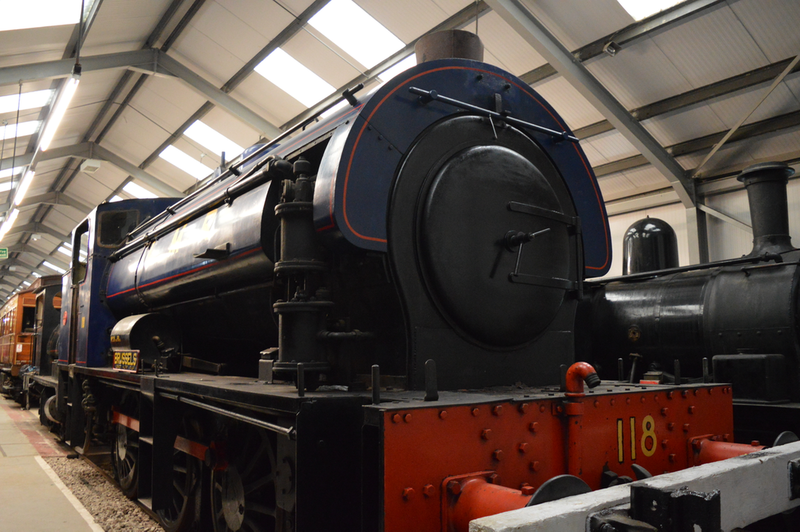 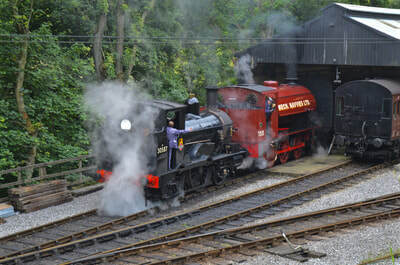 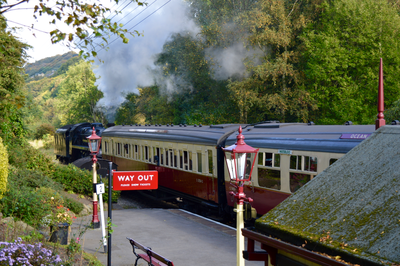 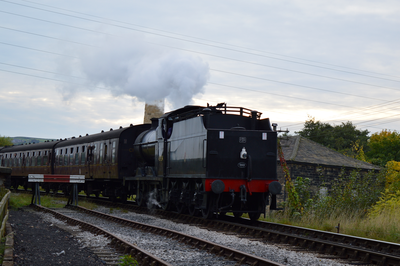 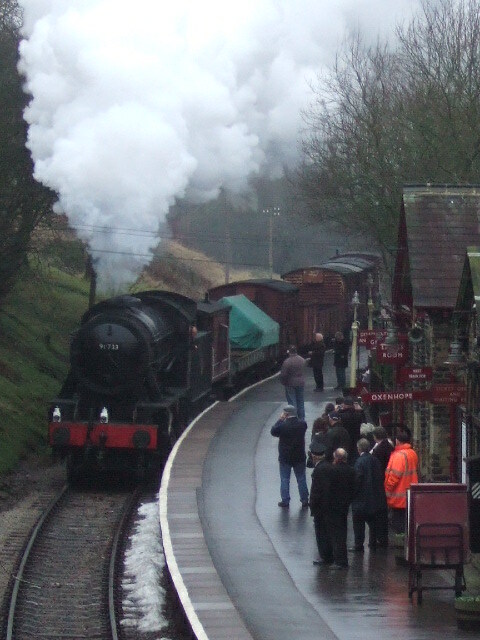 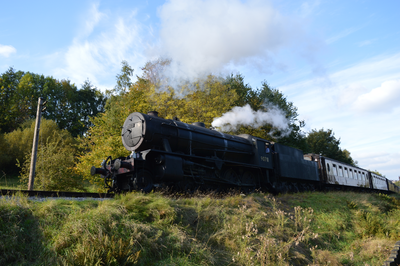 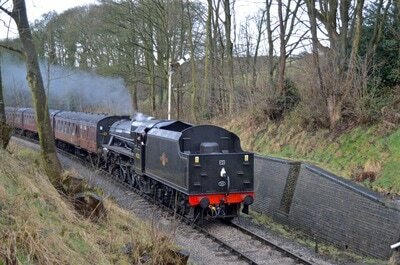 90733 was on shed in light steam during the day, and a brief glimpse of her is shown before we move back to 5820. 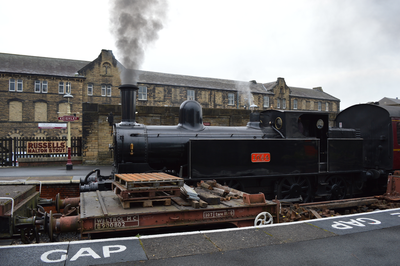 Here to see the locomotive make its way from Oxenhope to Keighley, firstly departing Oxenhope, then arriving into Howarth and finally arriving into Keighley. 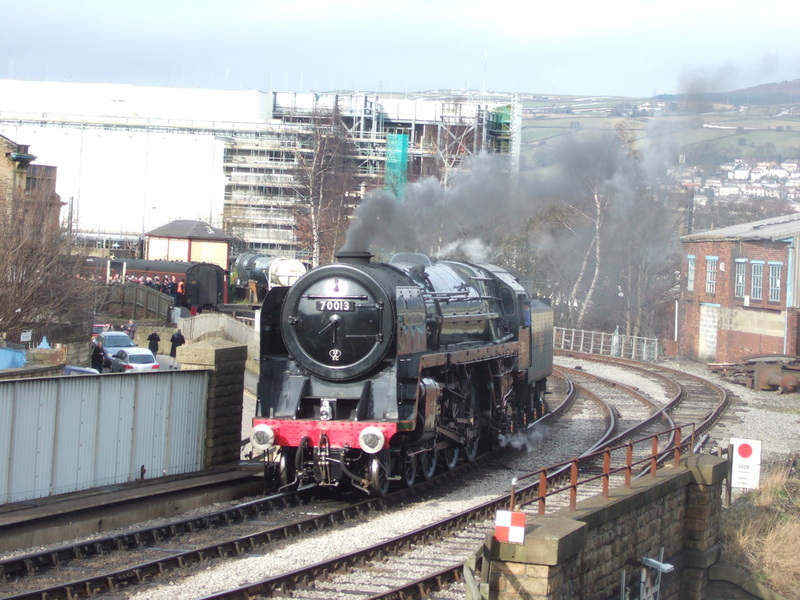 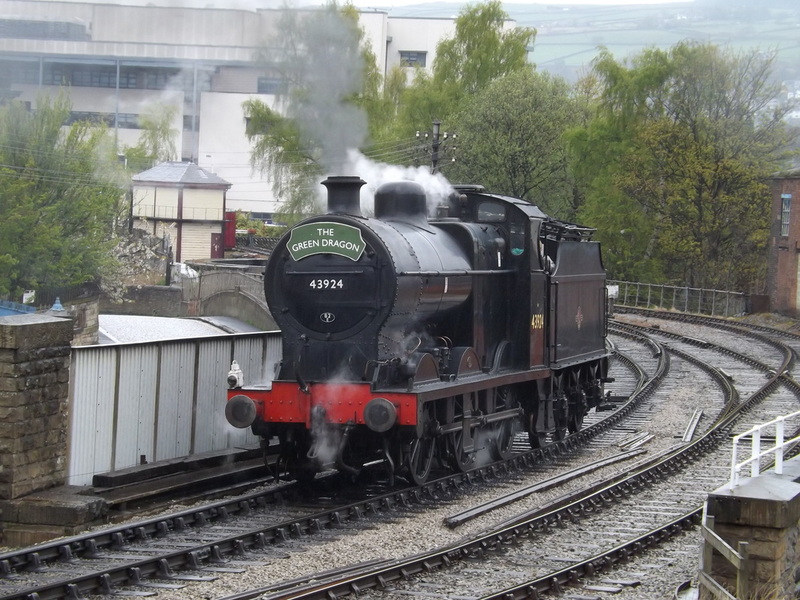 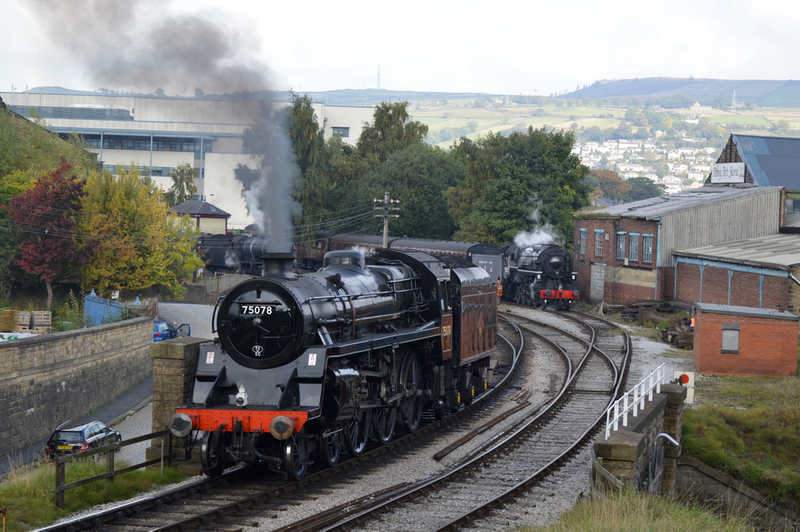 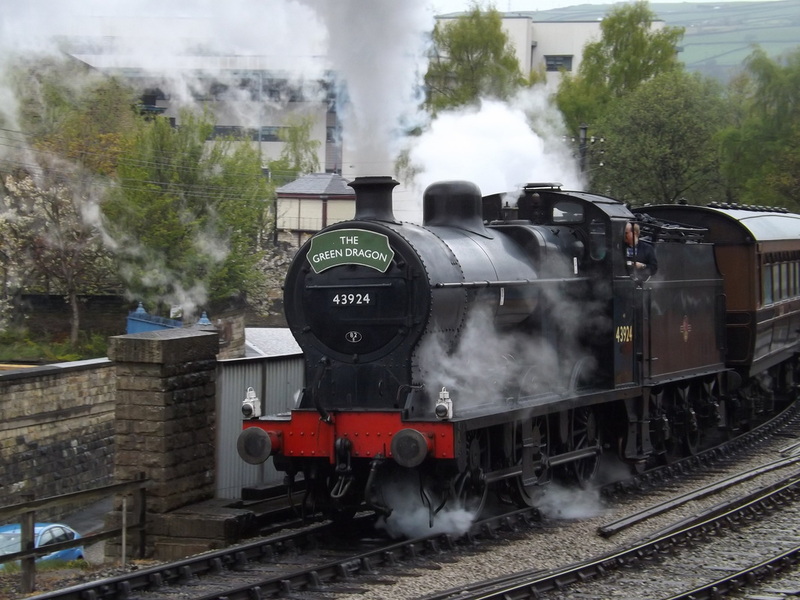 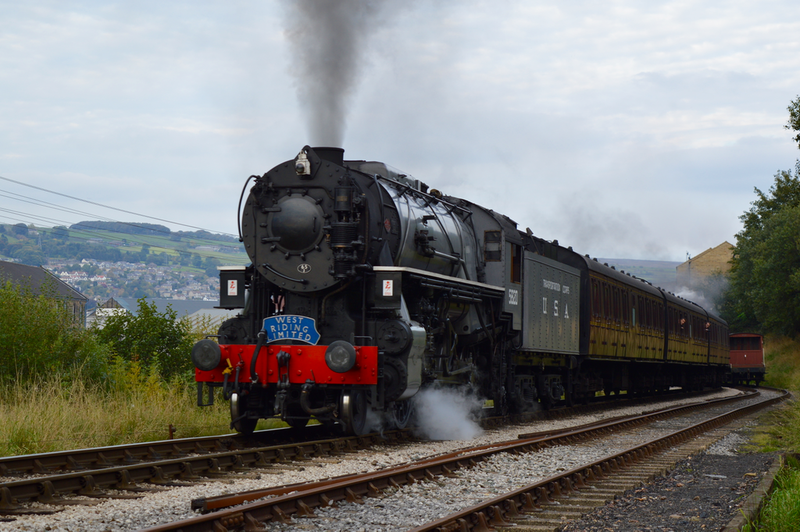 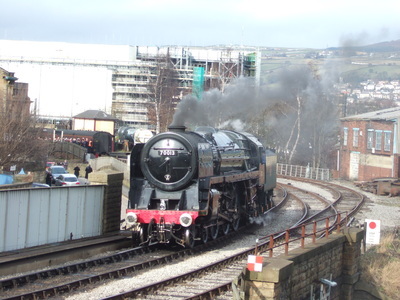 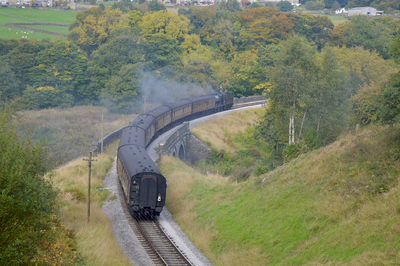 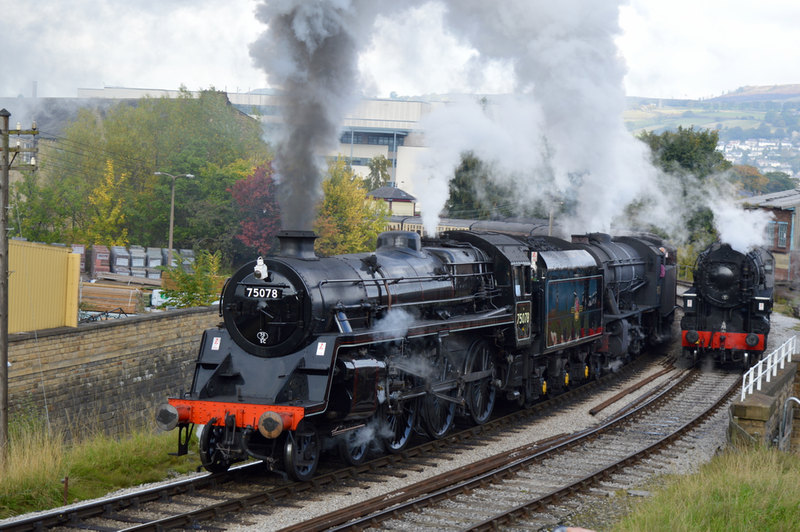 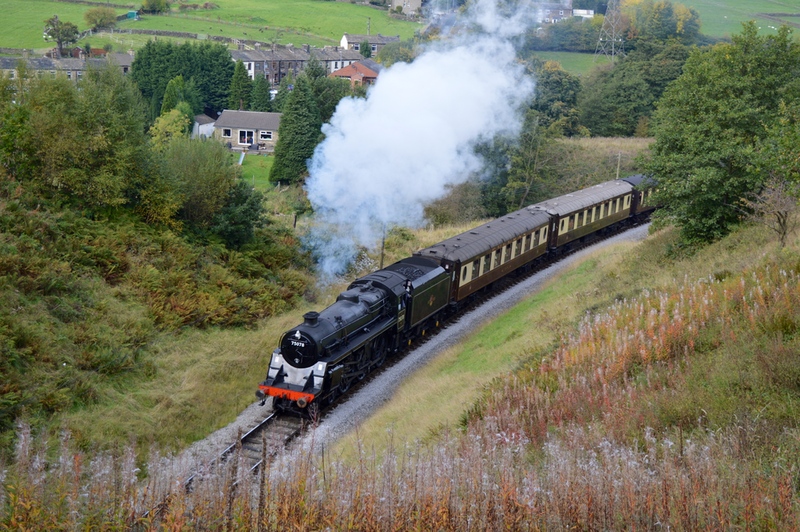 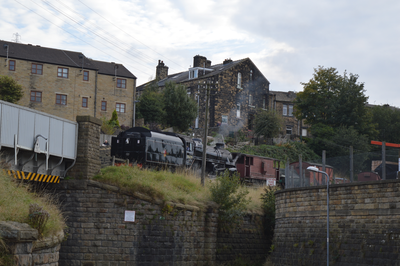 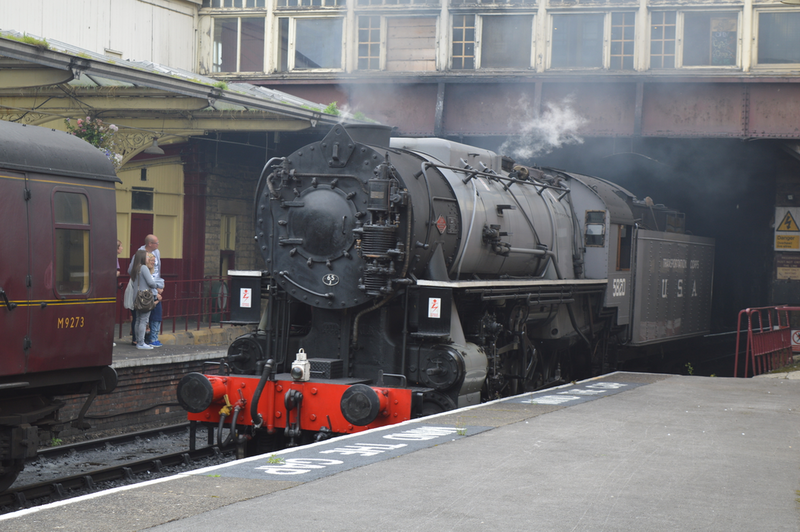 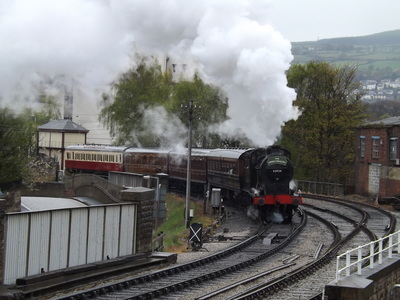 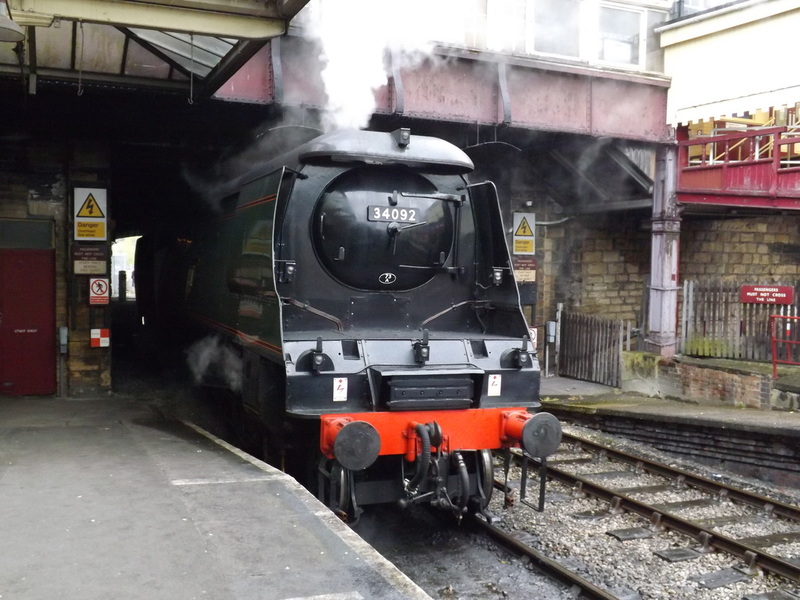 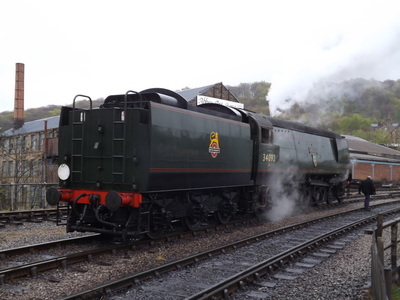 Some shots of the run round at Keighley are included, before some onboard footage of the climb out of Keighley from the 14:45. 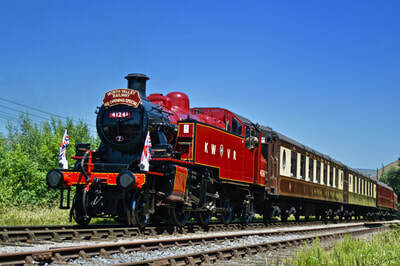 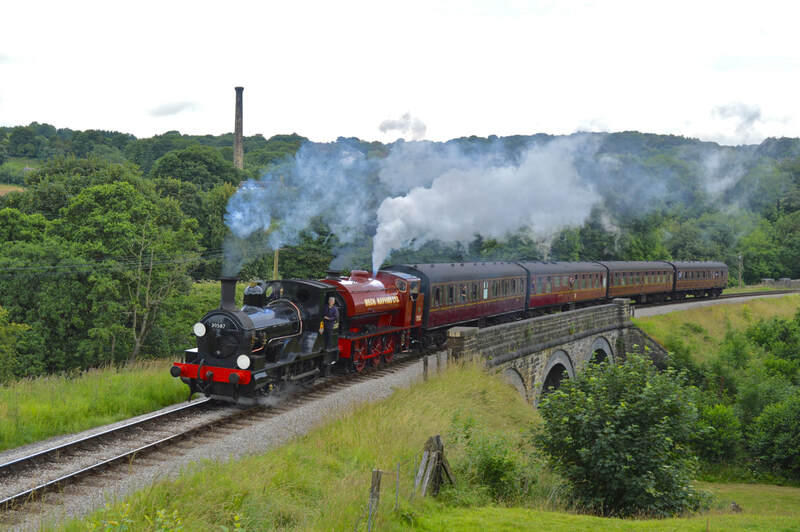 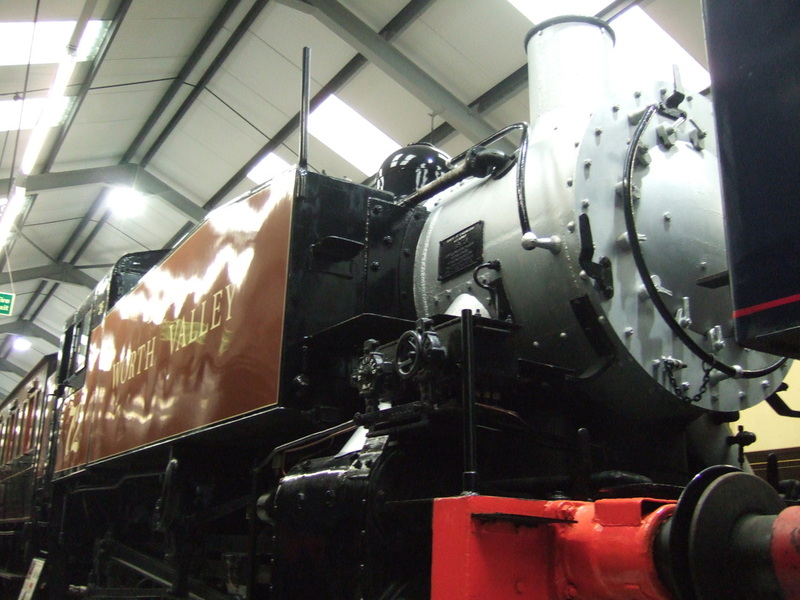 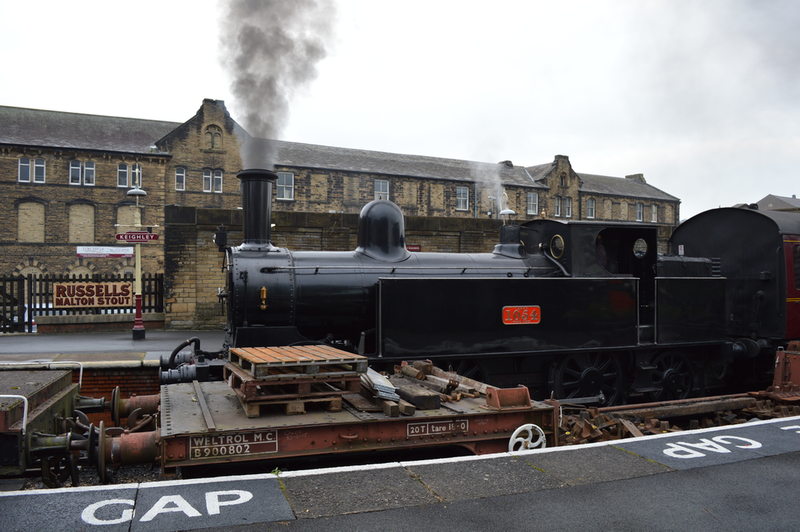 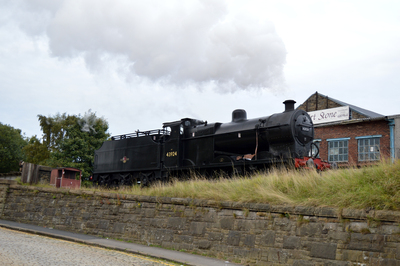 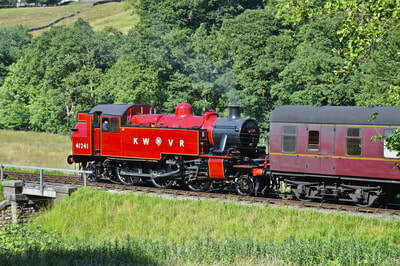 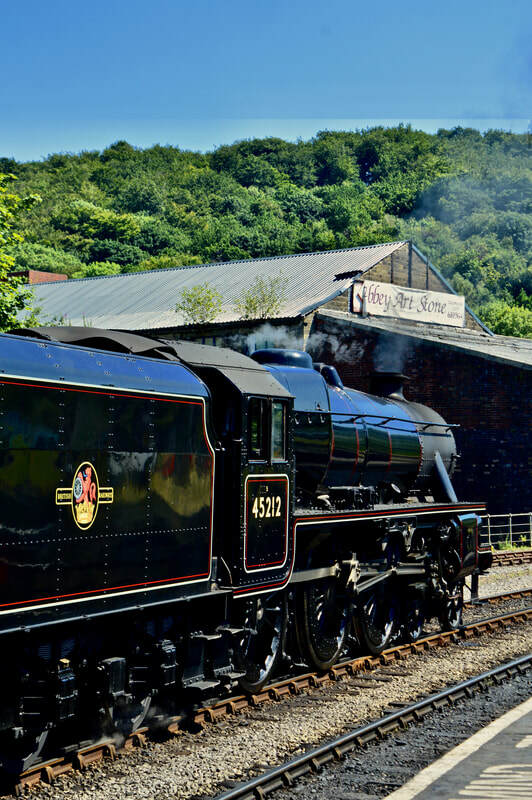 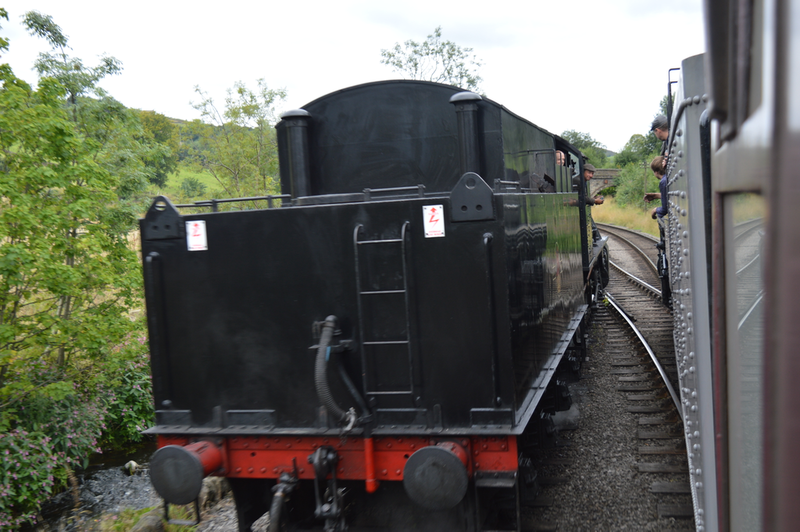 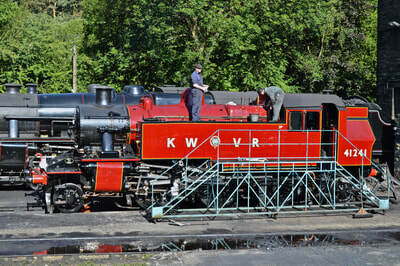 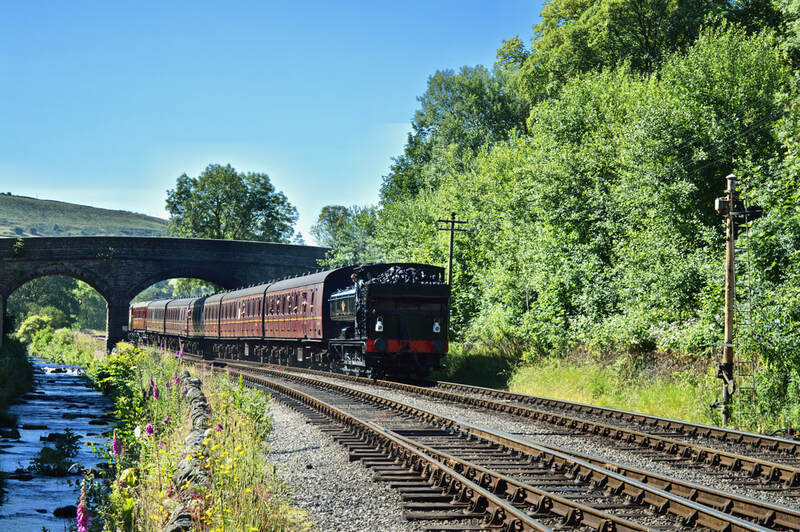 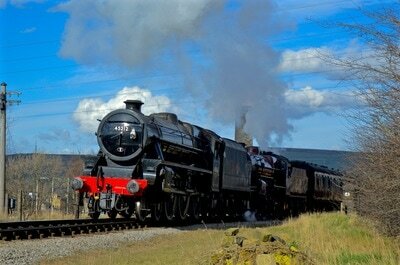 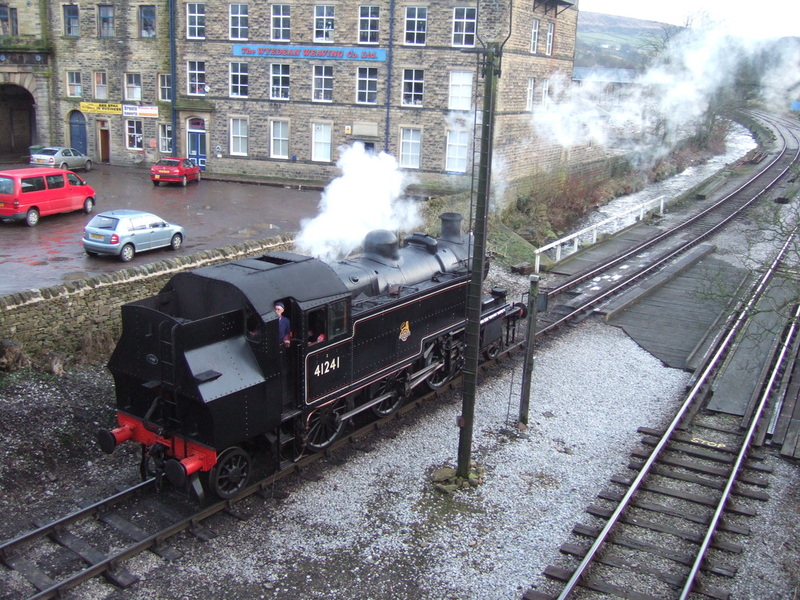 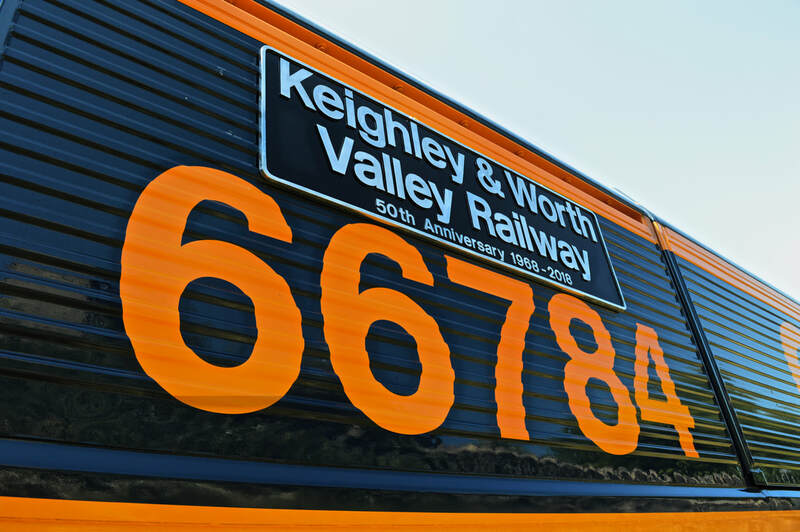 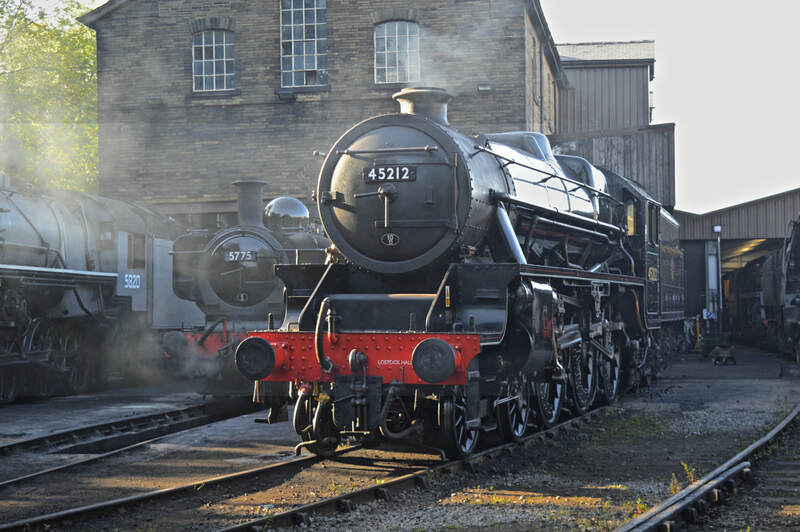 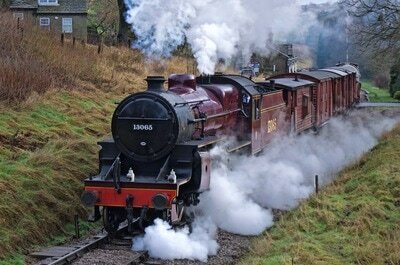 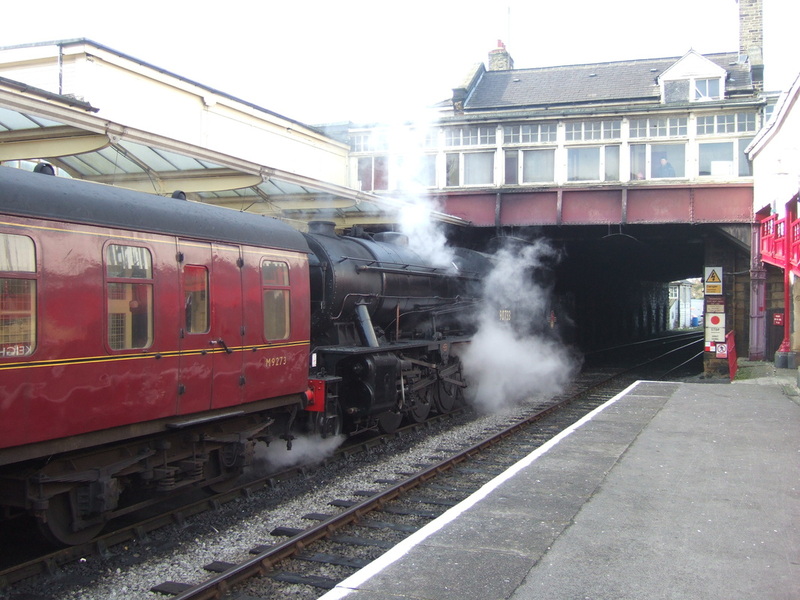 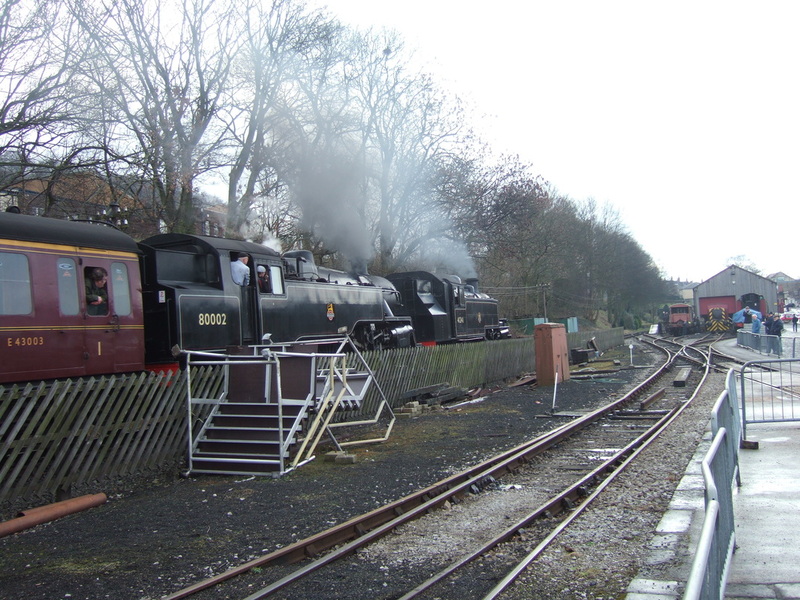 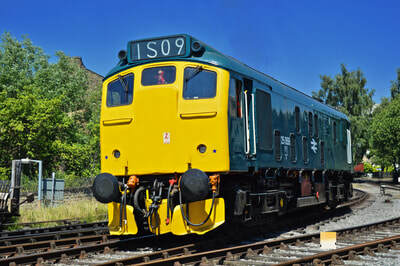 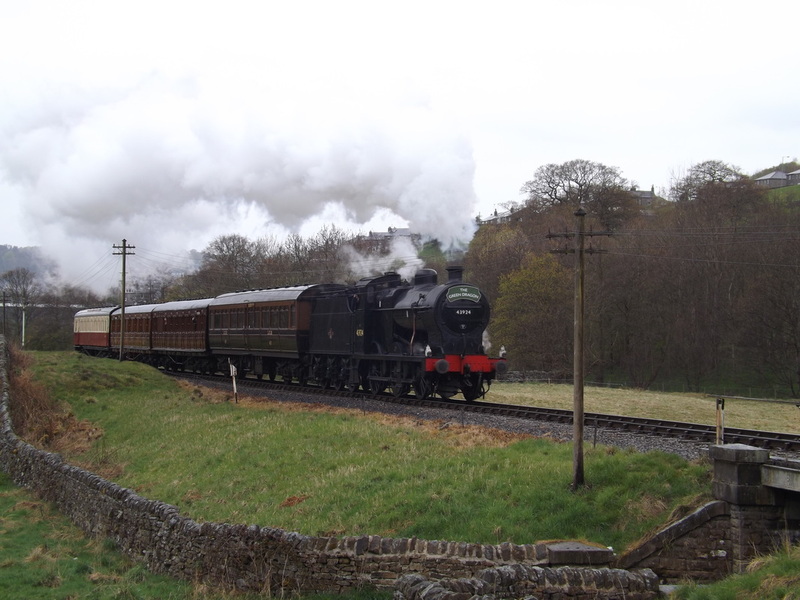 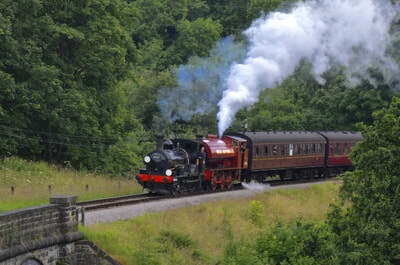 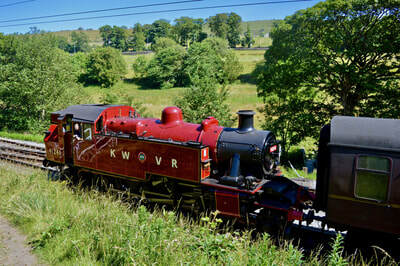 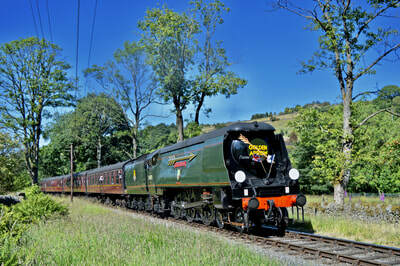 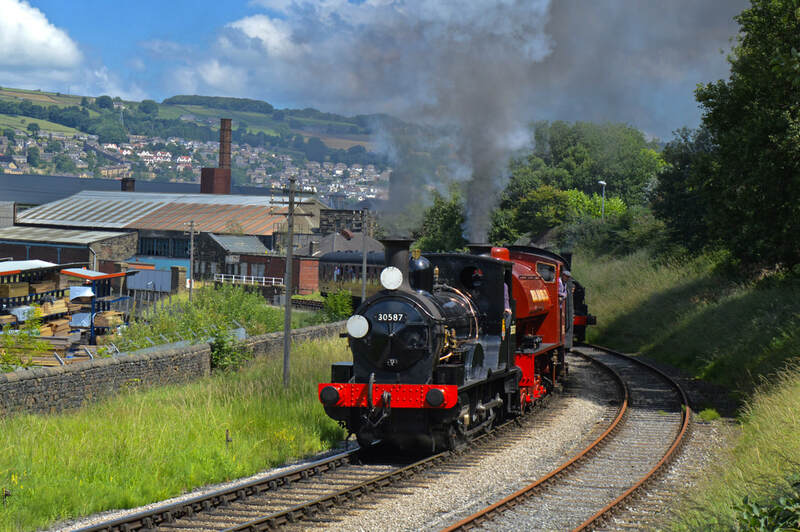 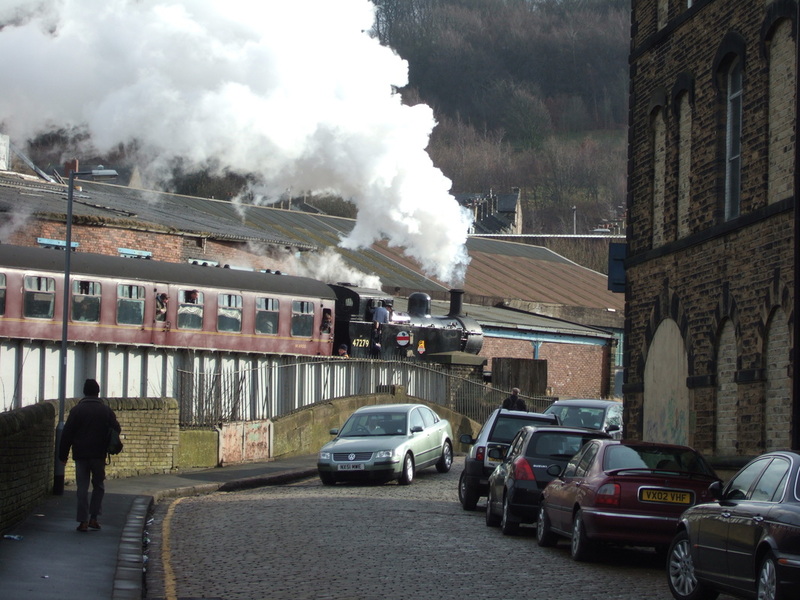 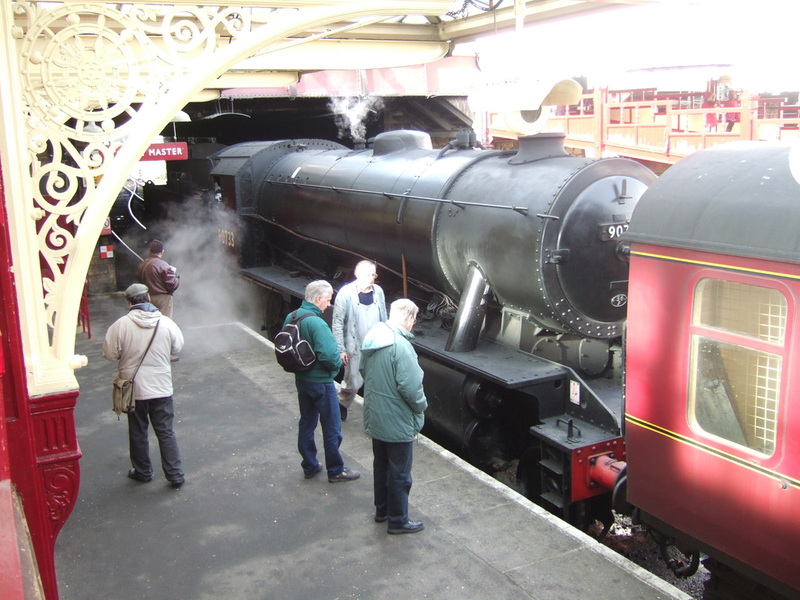 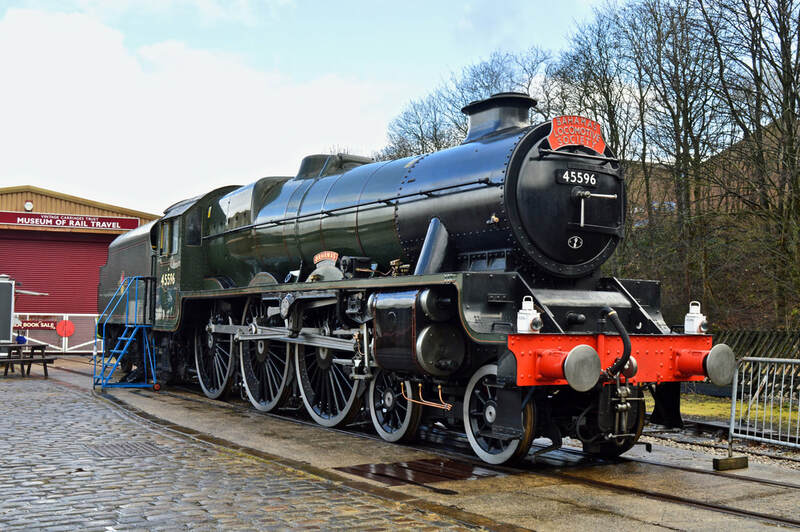 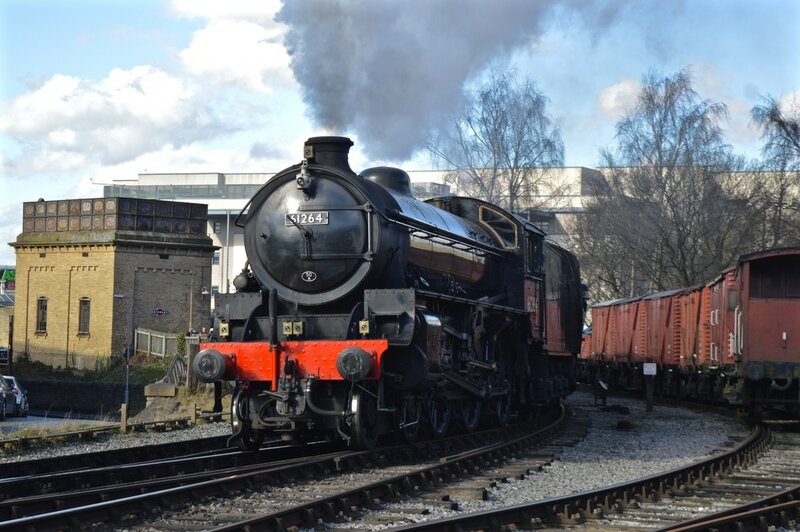 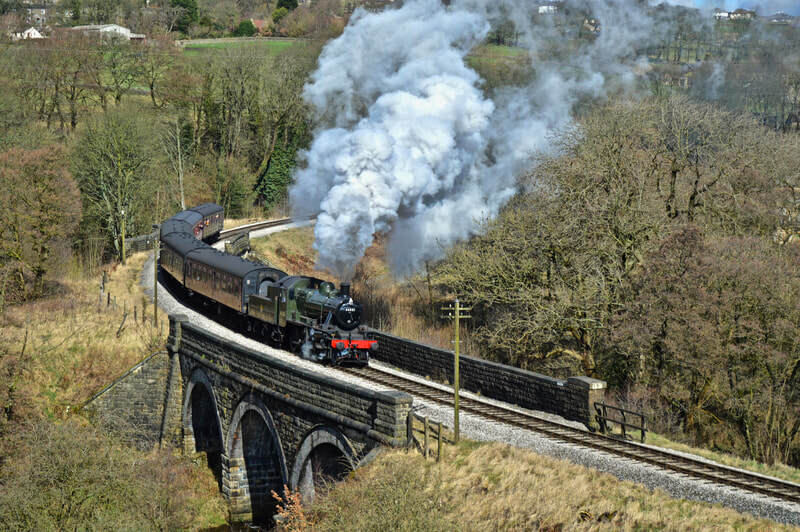 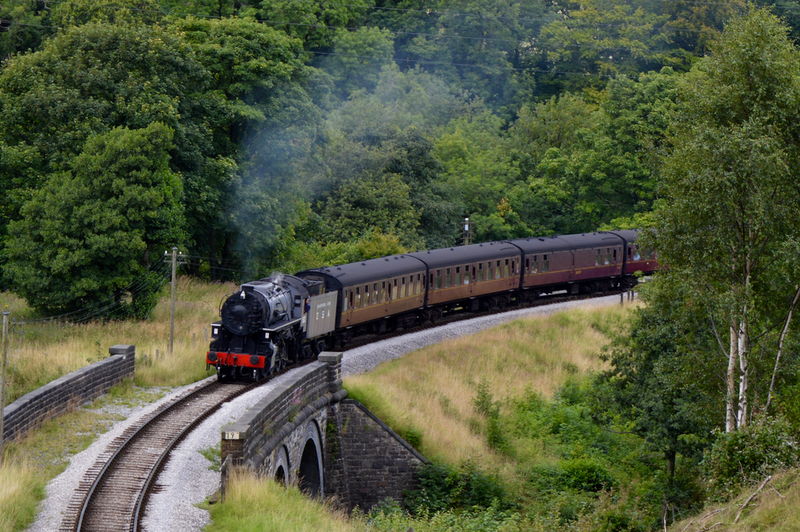 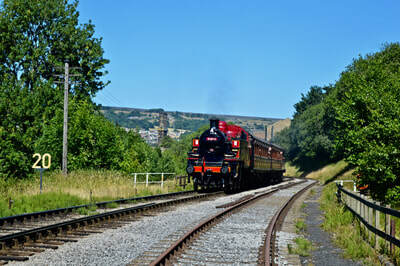 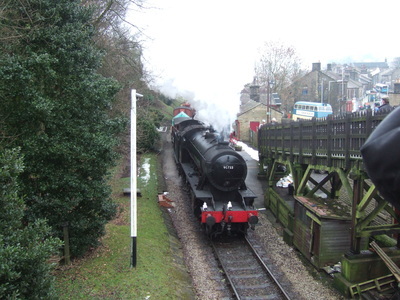 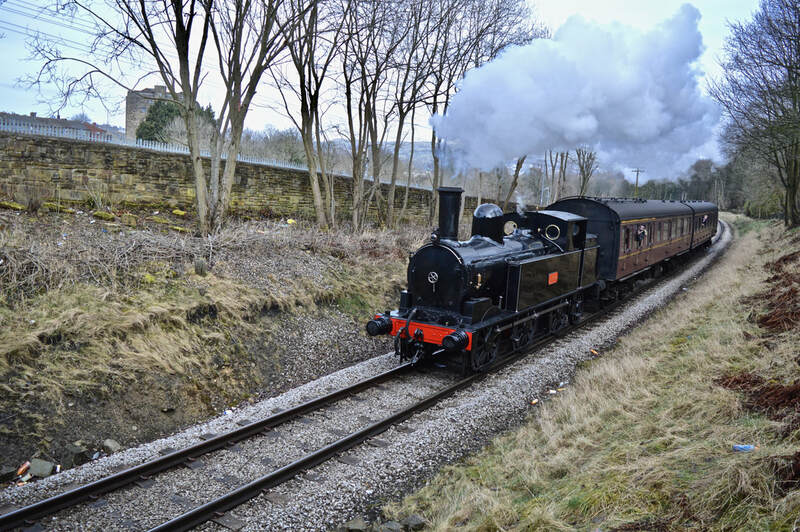 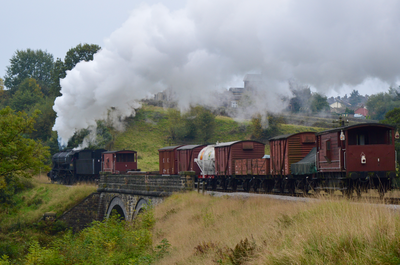 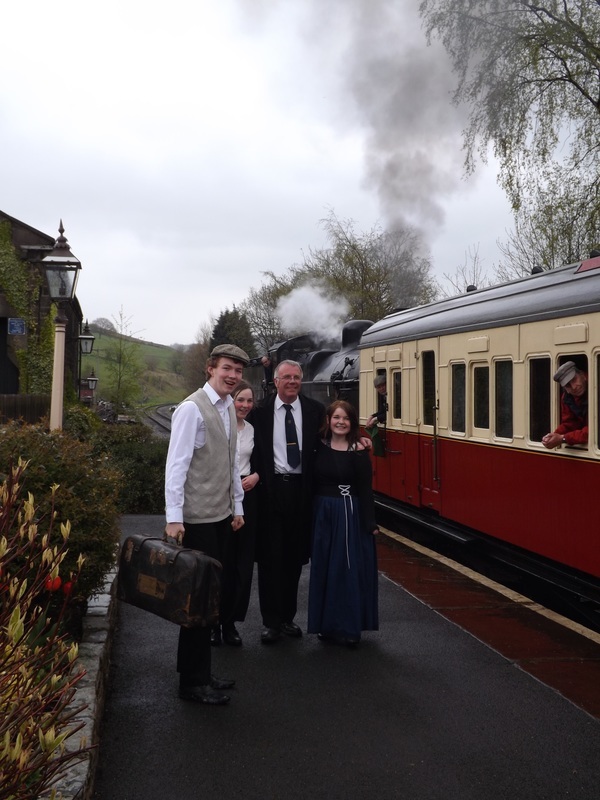 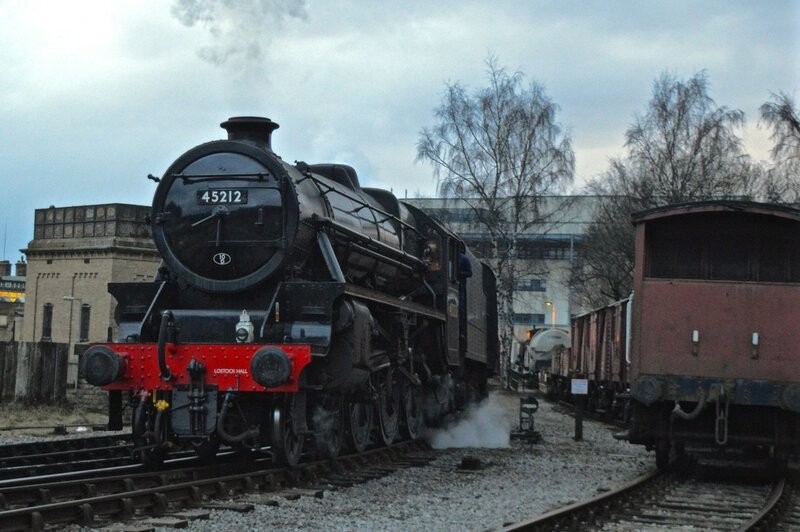 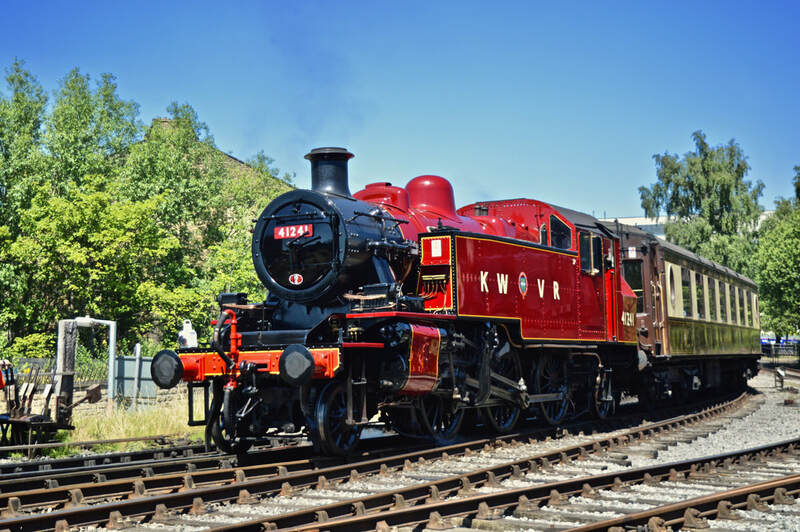 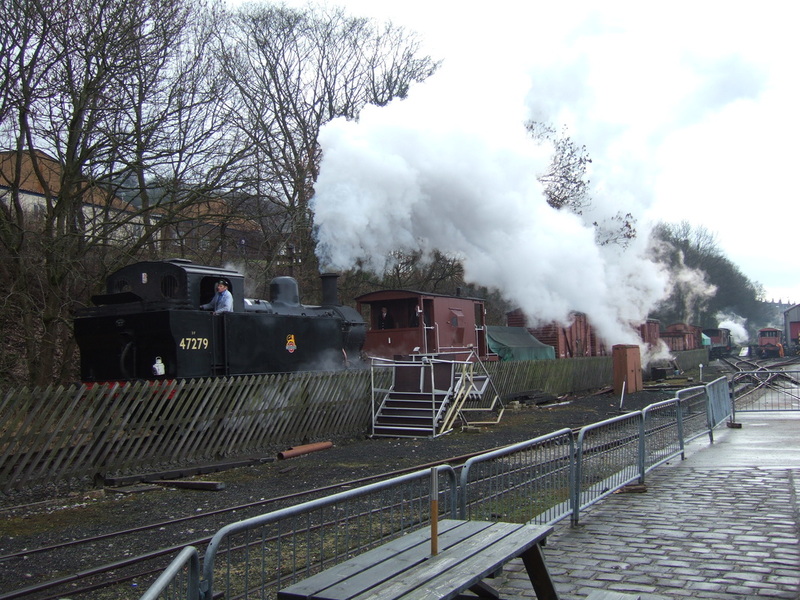 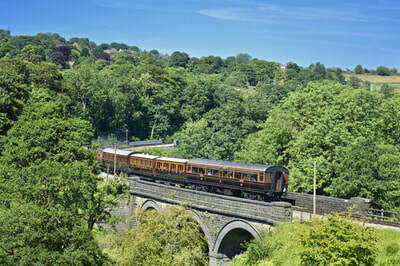 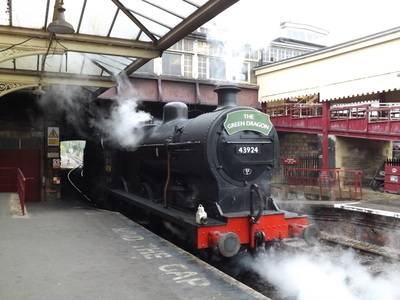 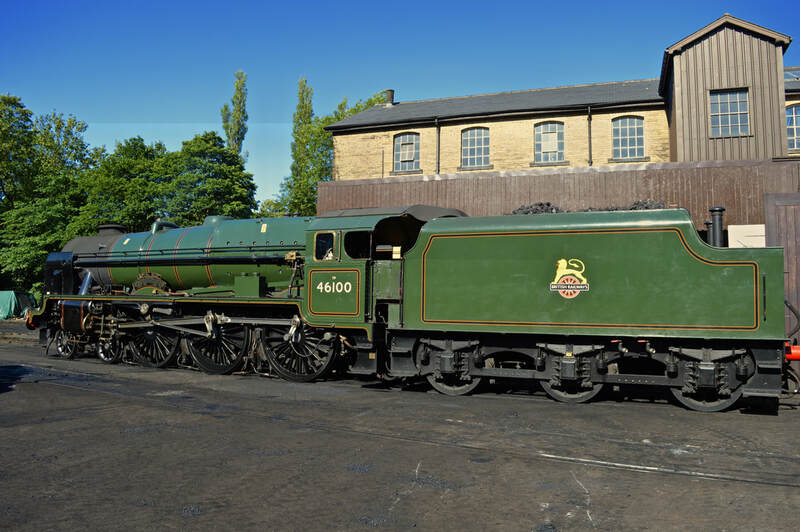 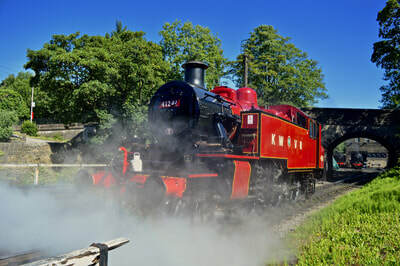 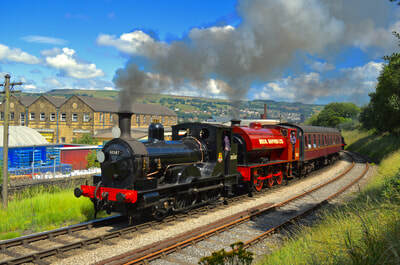 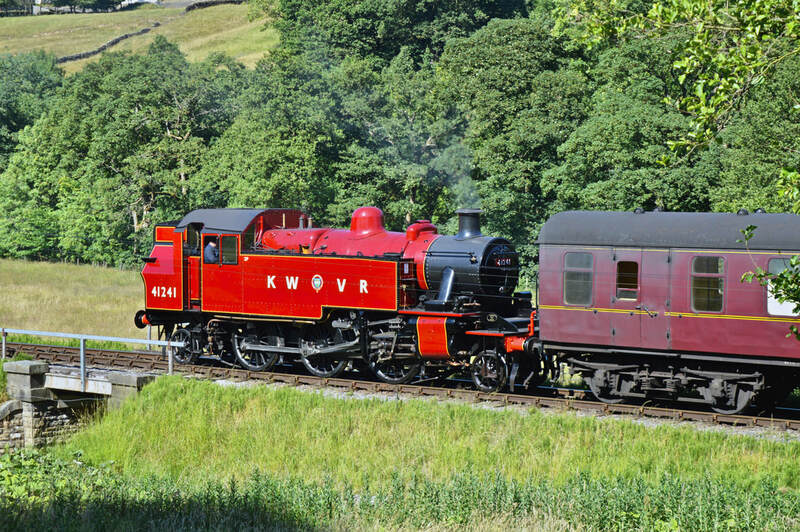 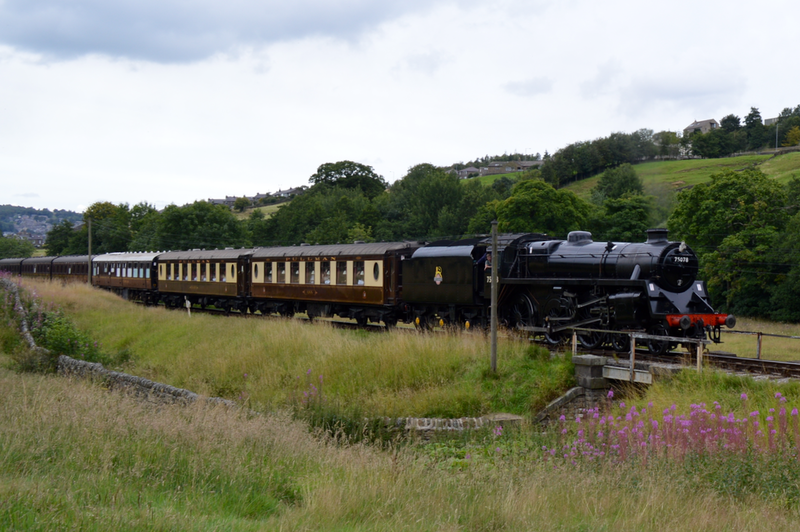 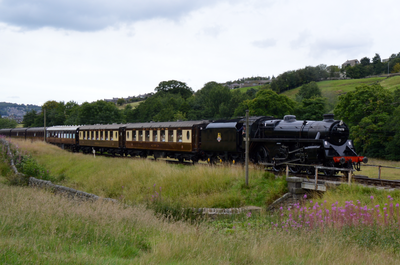 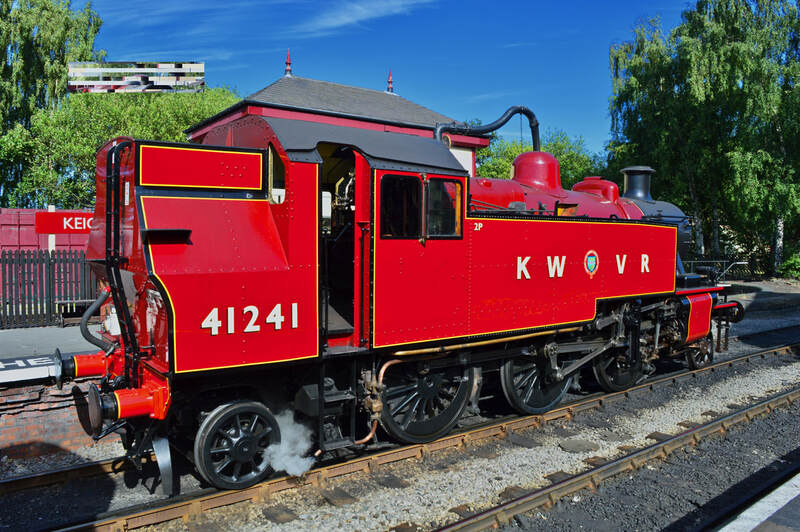 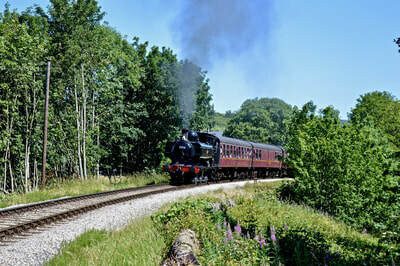 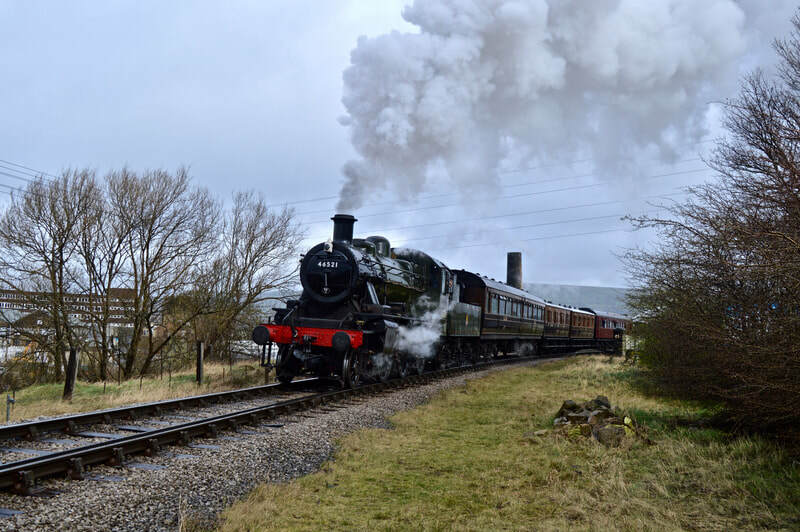 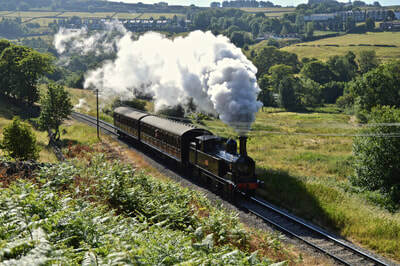 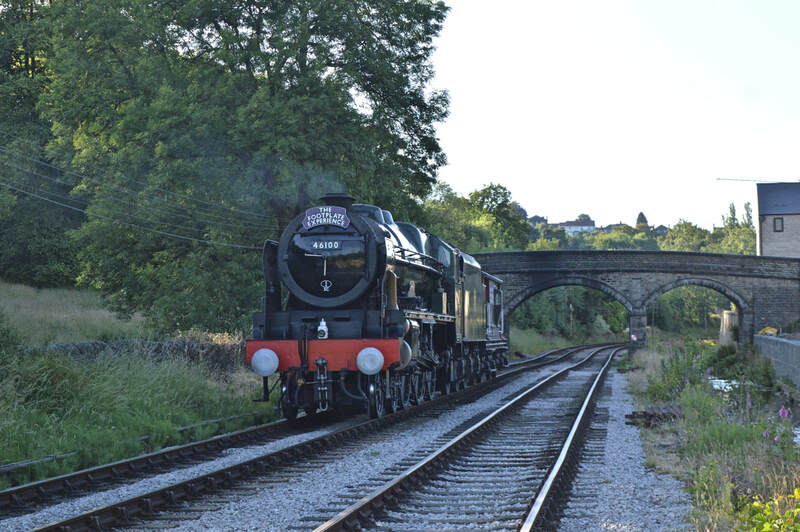 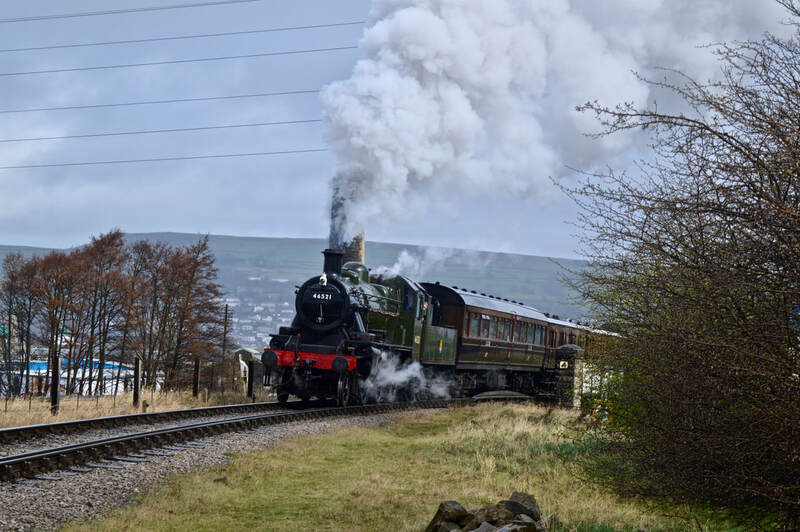 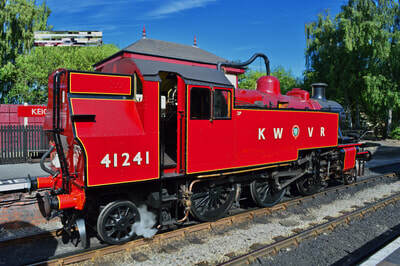 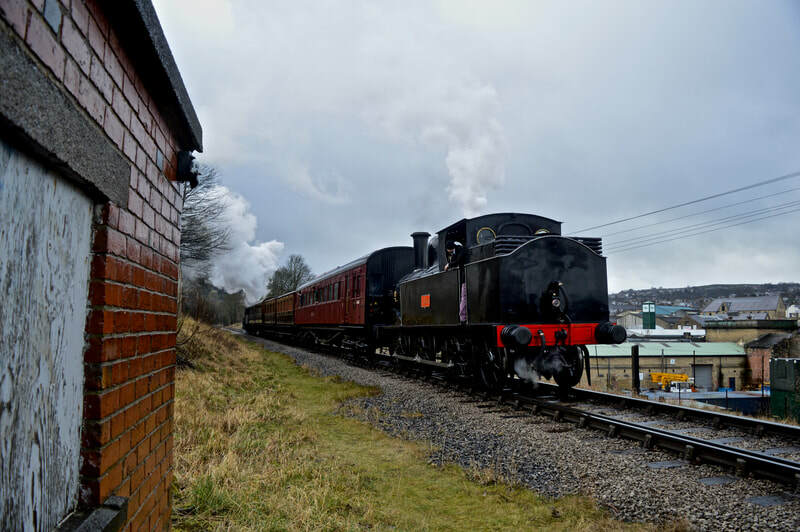 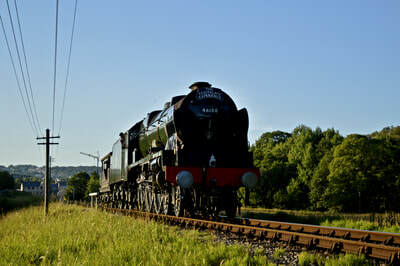 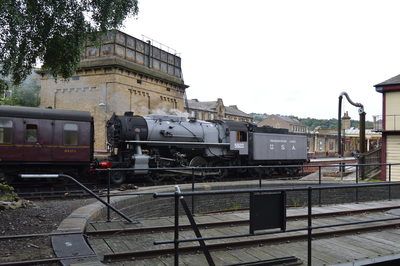 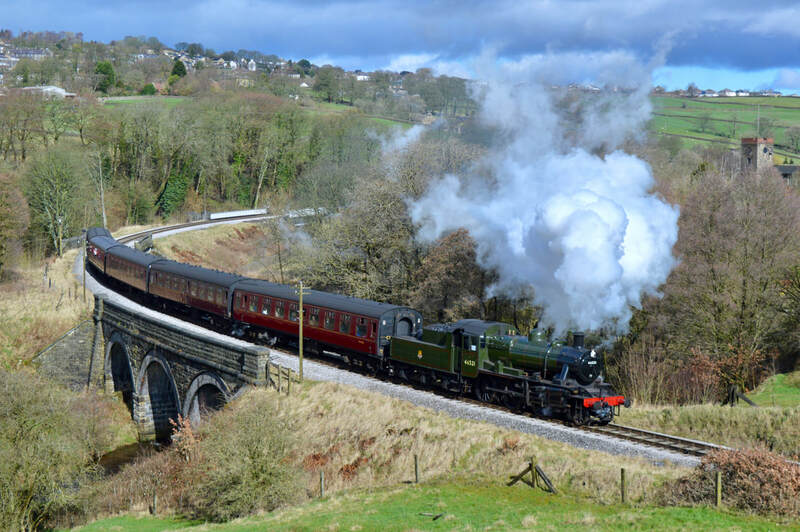 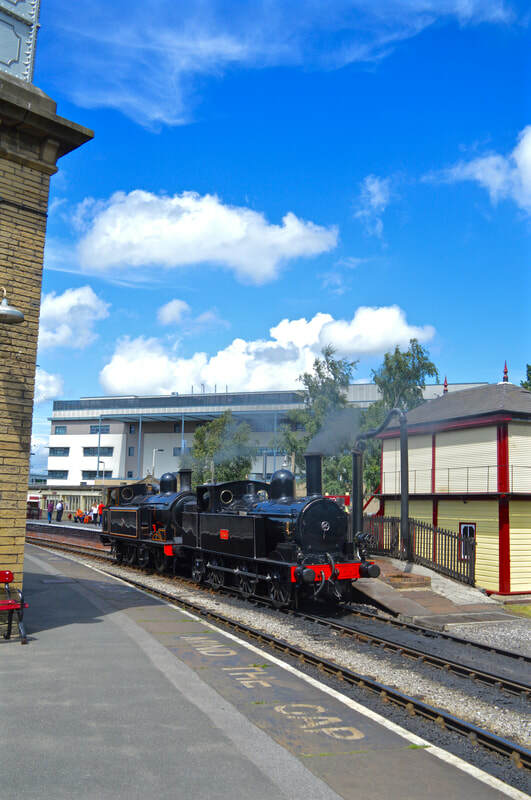 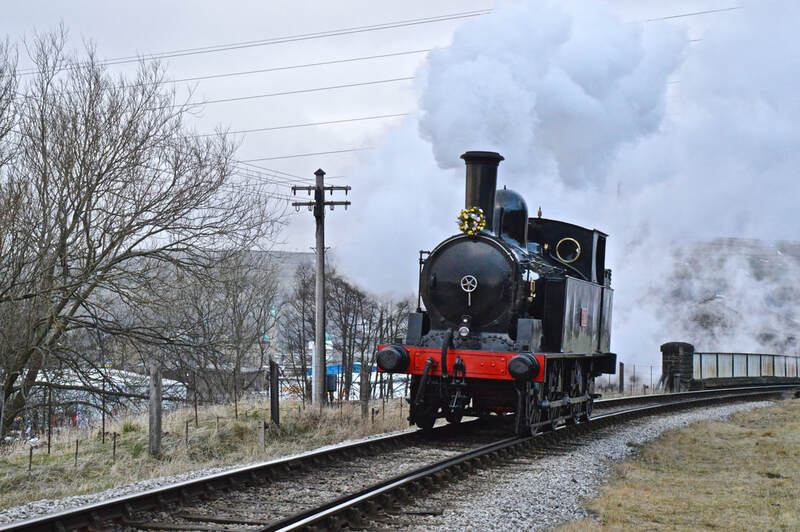 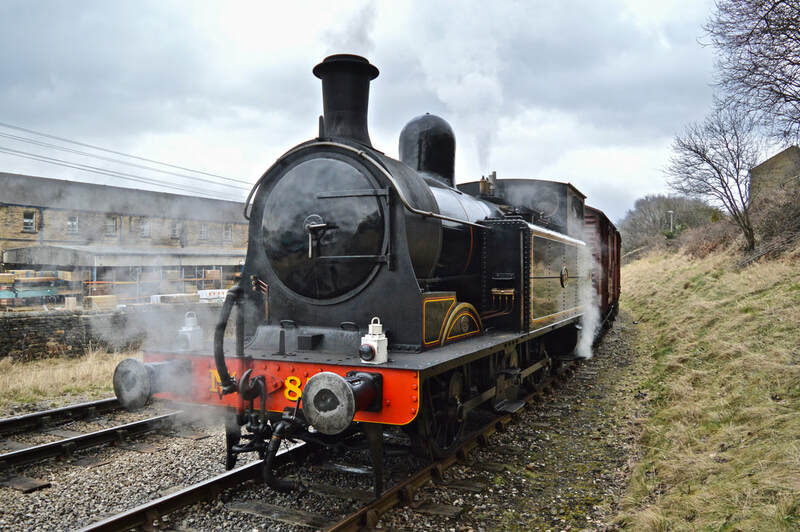 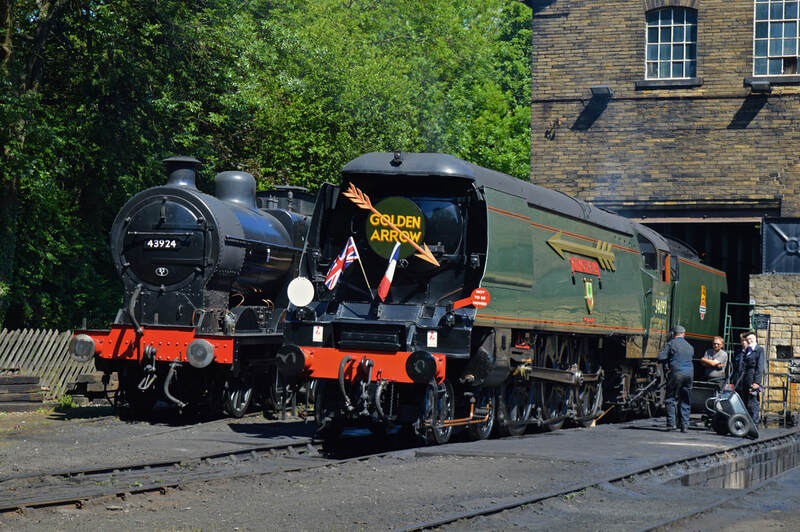 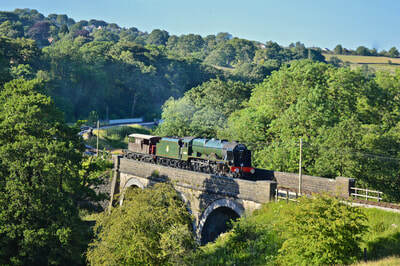 The Keighley & Worth Valley Railway is a complete preserved branch line, 5 miles long from Keighley station to Oxenhope. 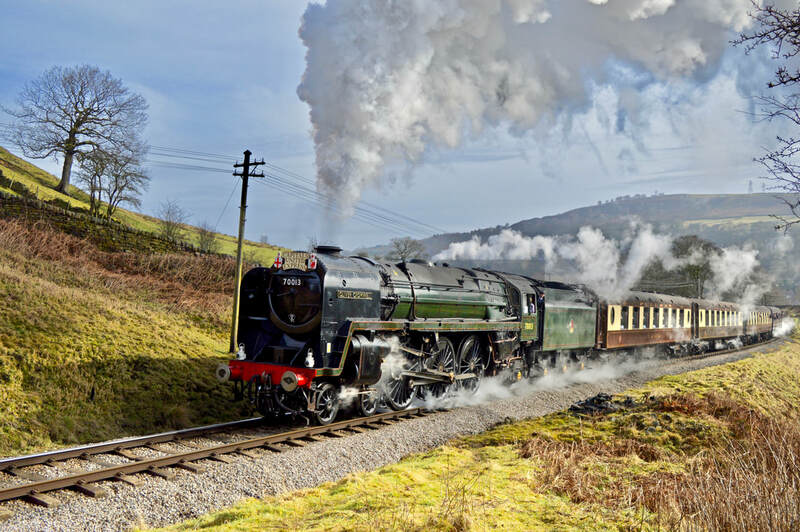 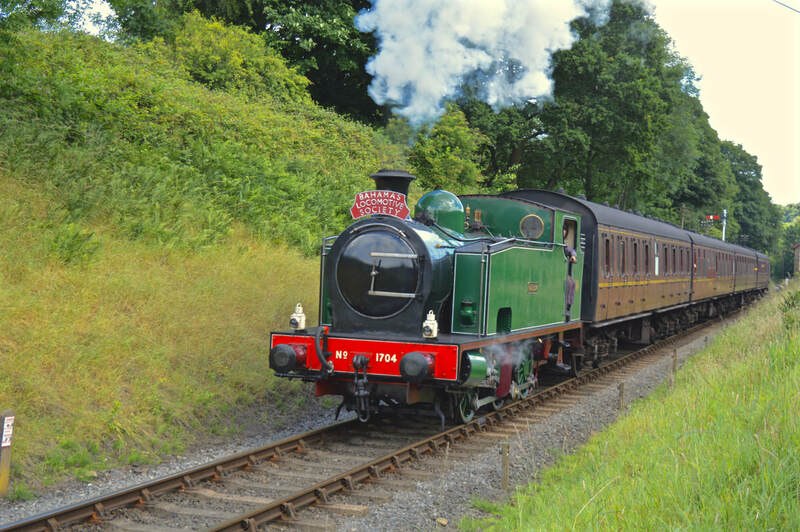 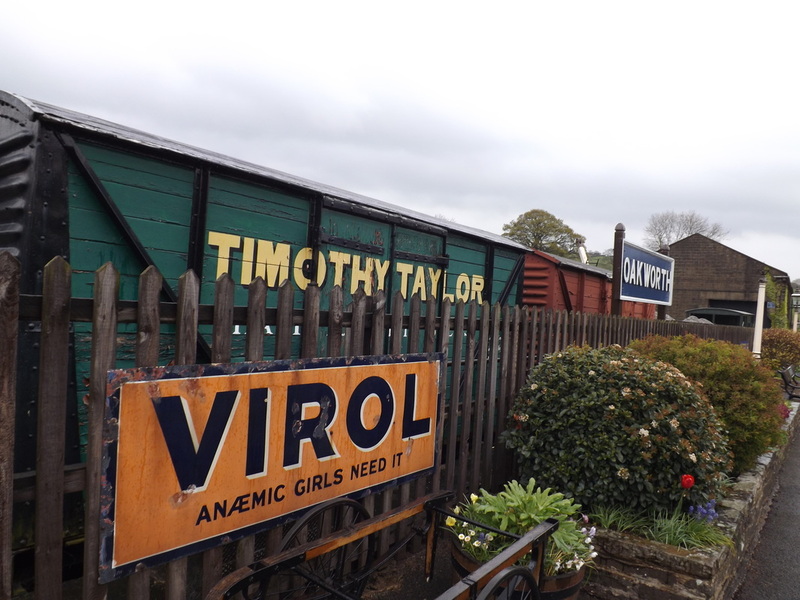 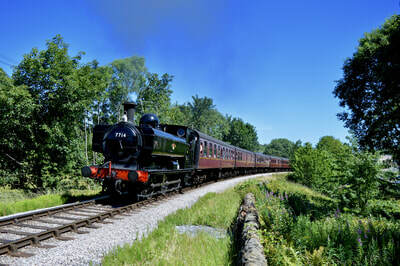 Reopened in 1968, the line has thrived ever since in no small part due to the part it has played in feature films, most famously 'The Railway Children'. 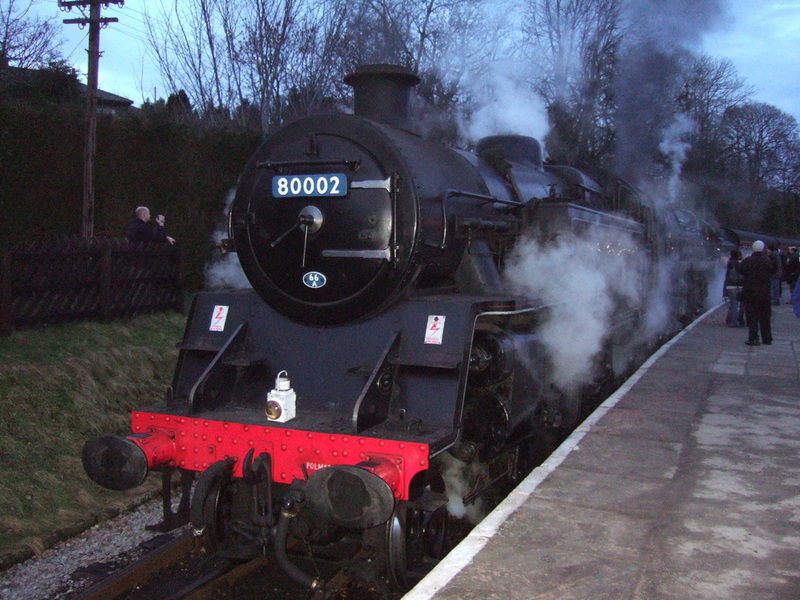 The popularity of the feature film filmed on the line boosted the lines profiles and popularity that a passing loop had to be added at Damens. 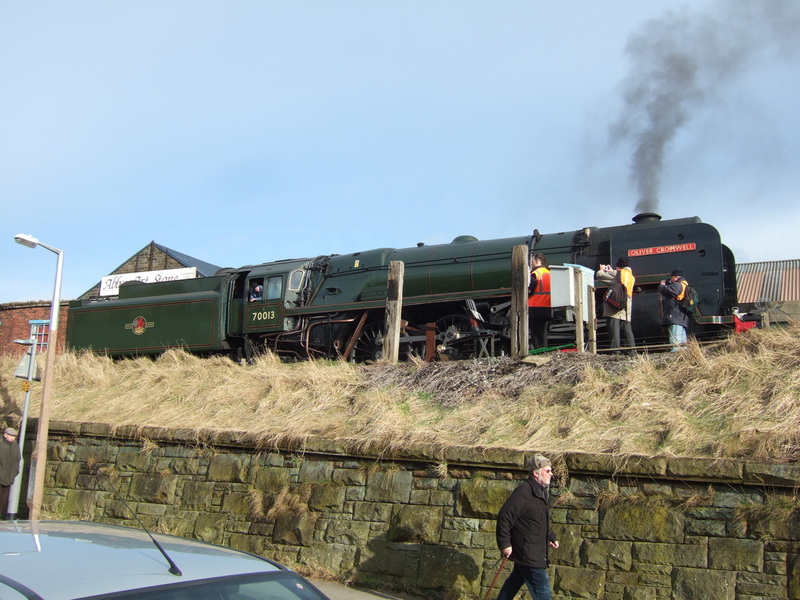 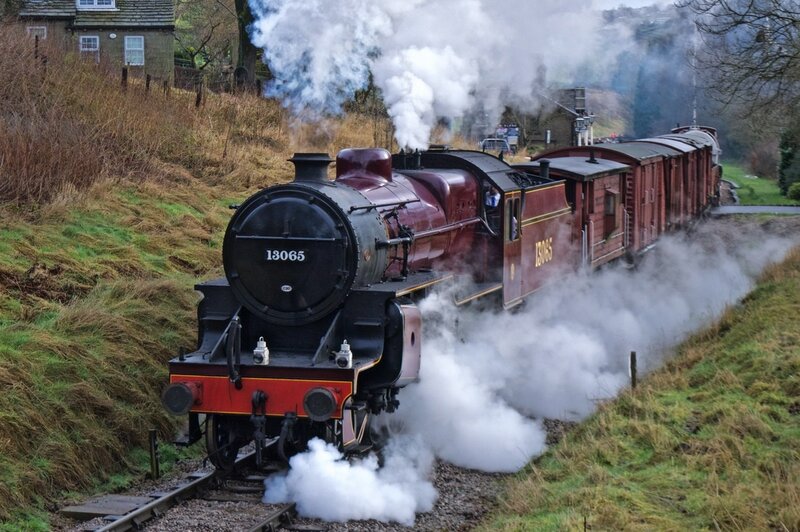 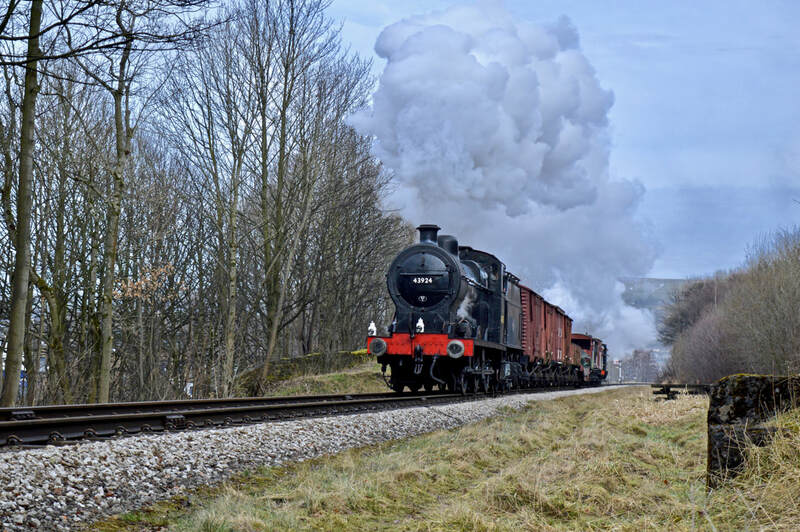 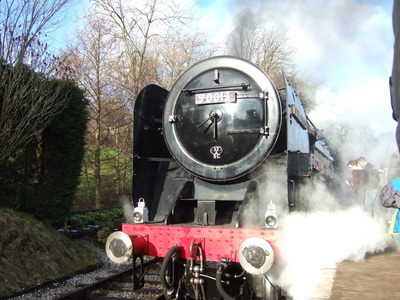 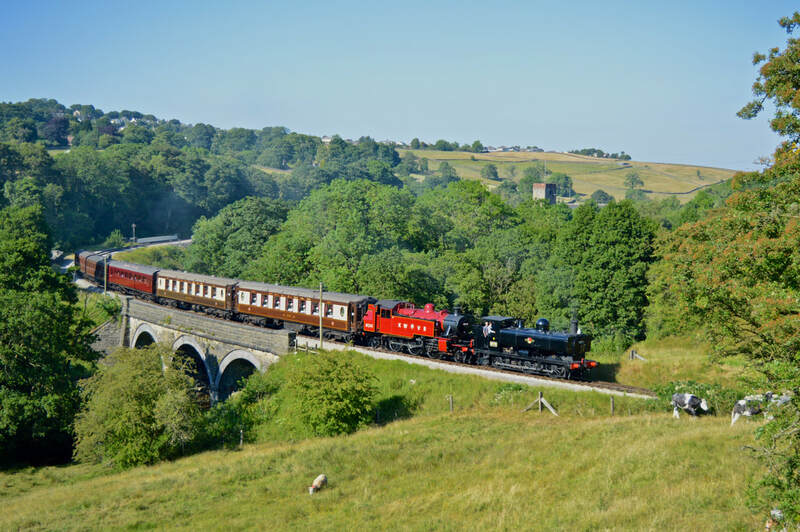 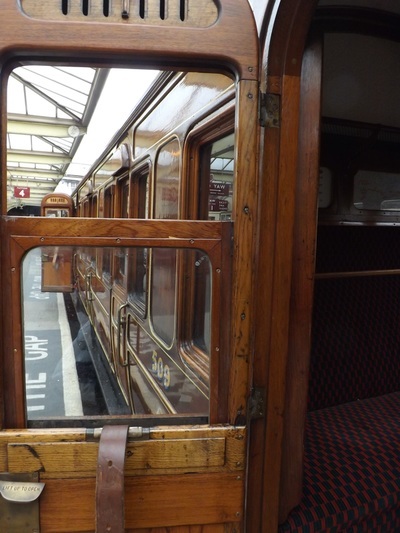 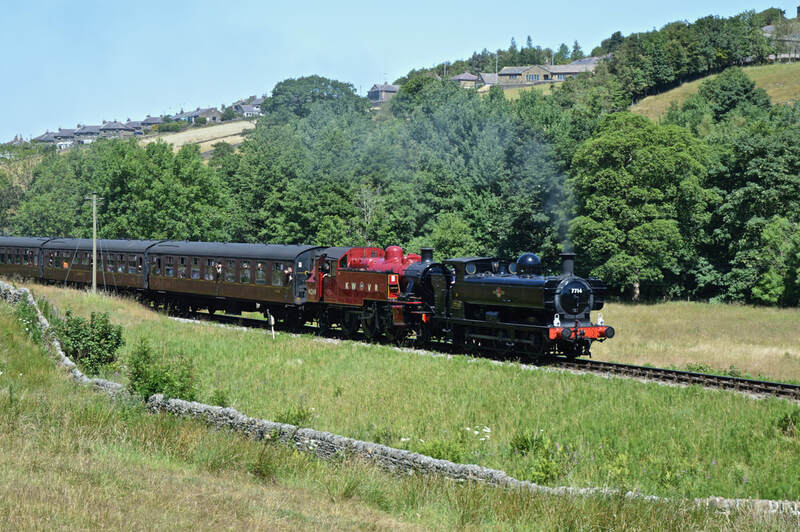 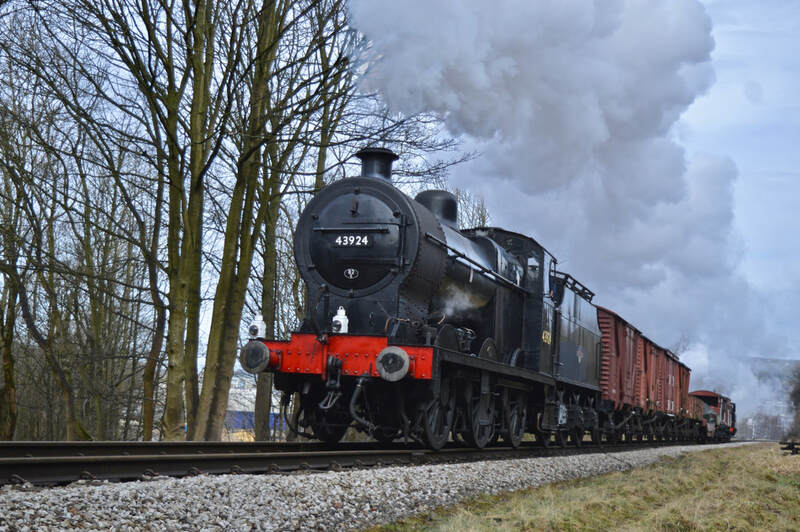 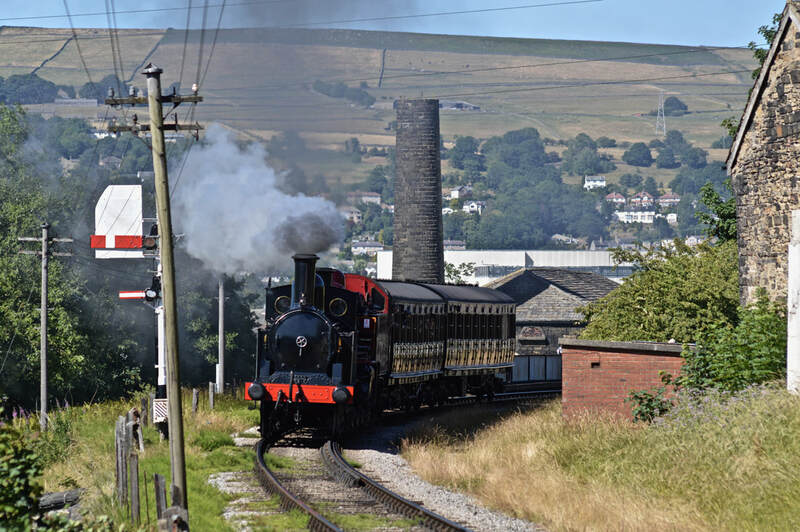 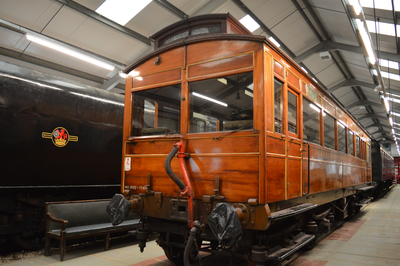 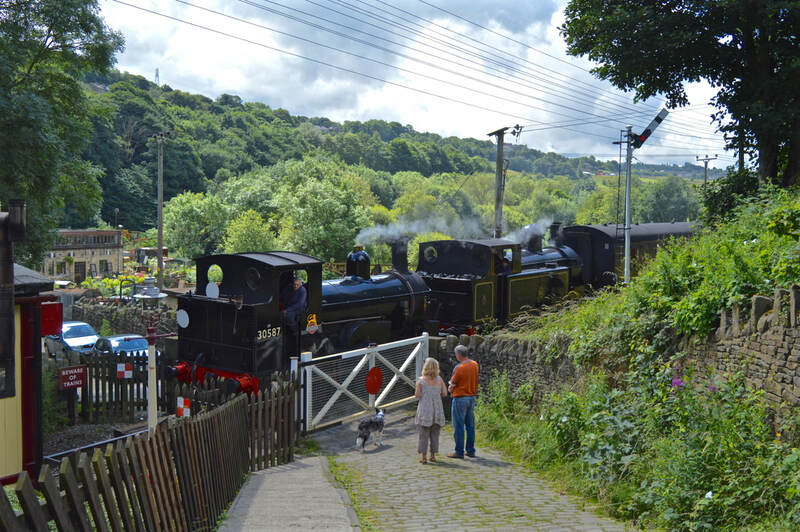 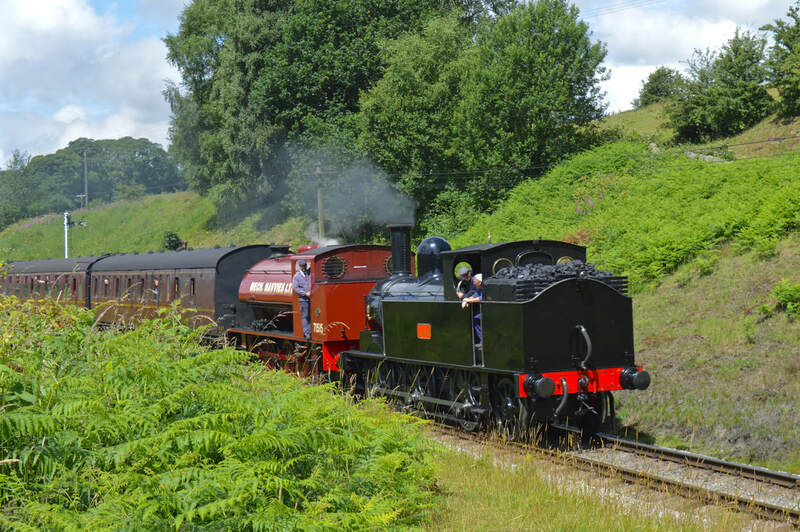 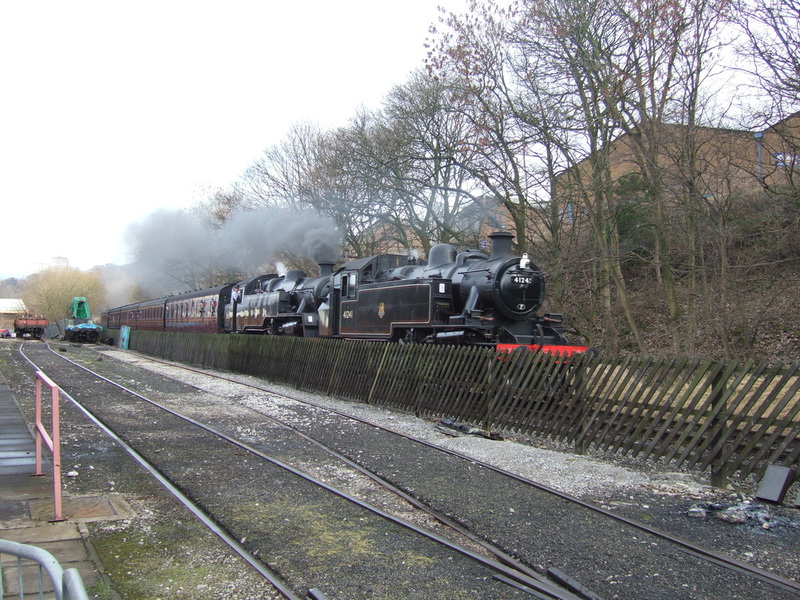 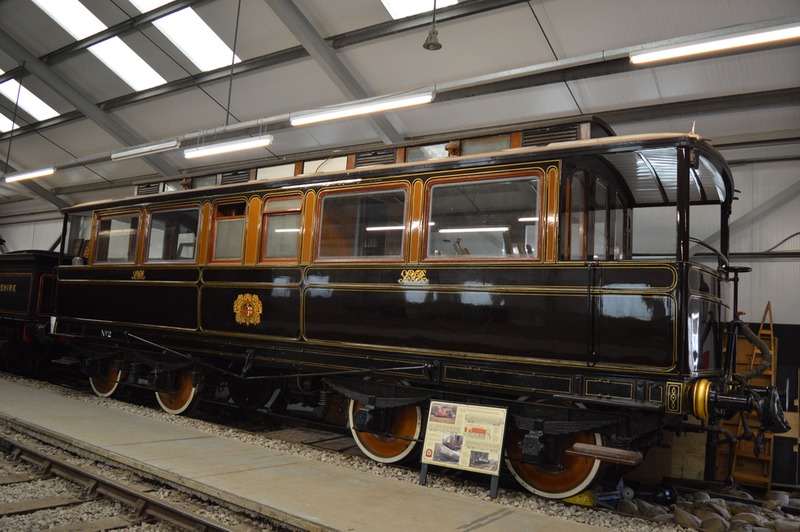 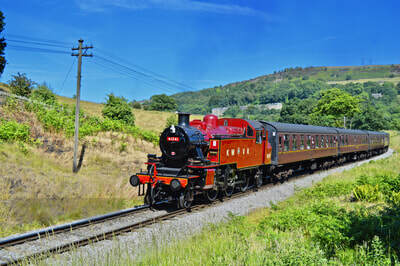 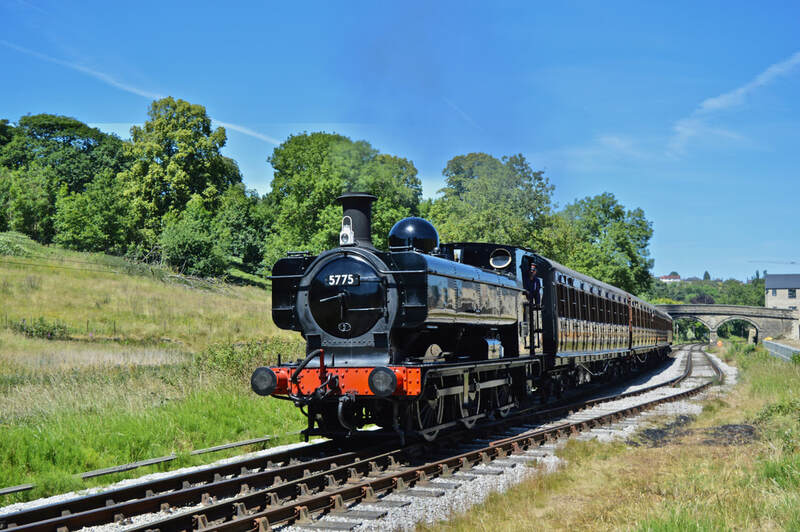 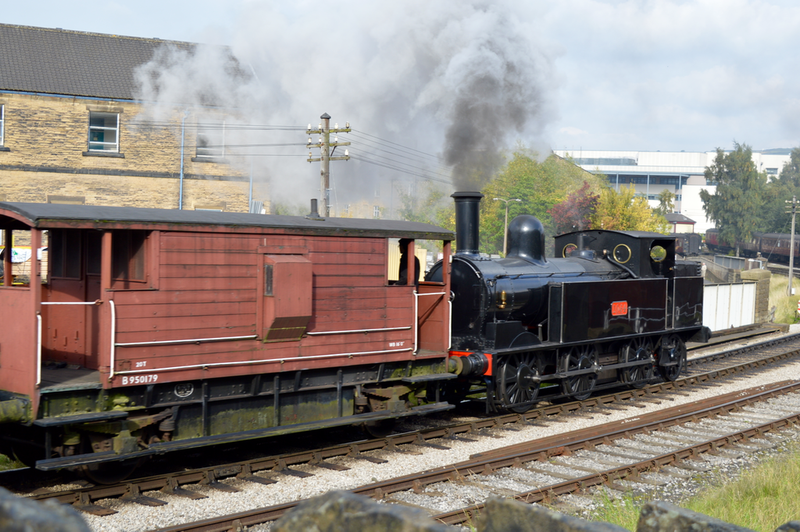 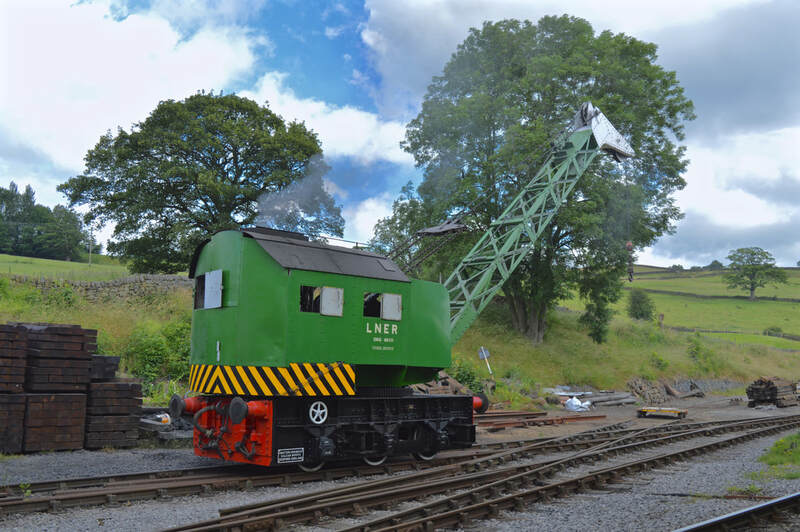 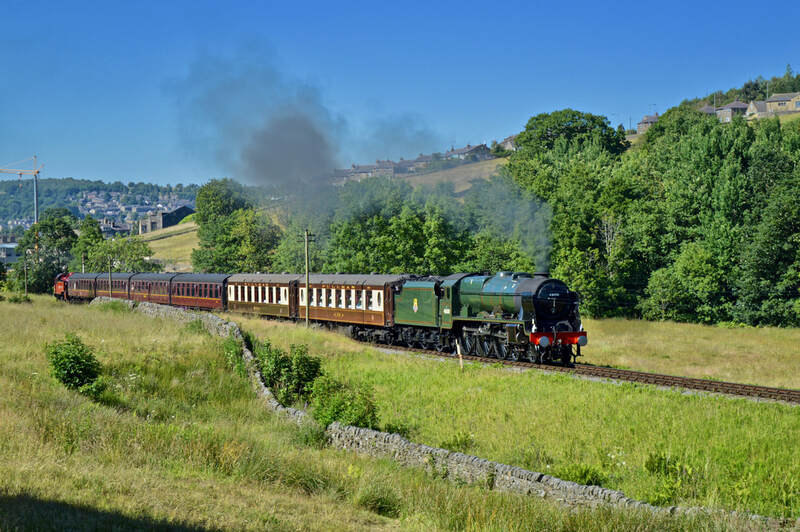 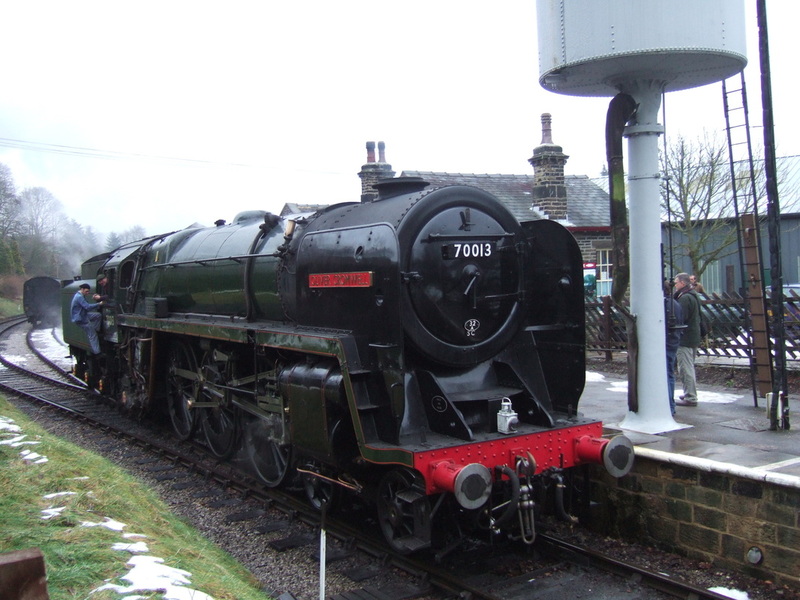 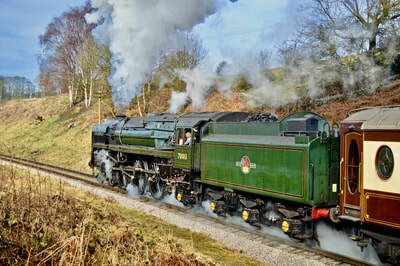 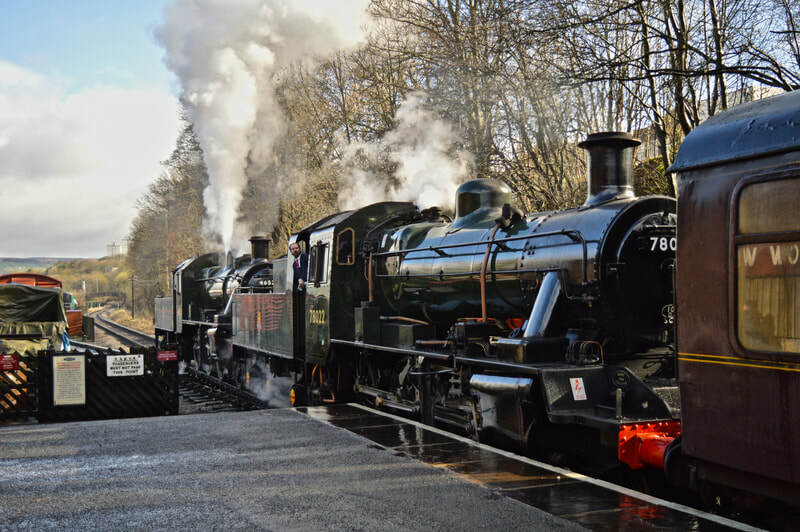 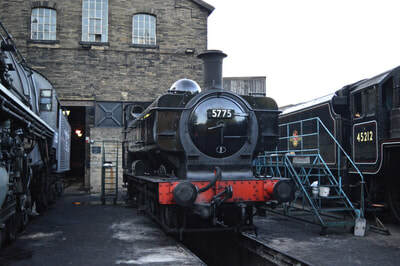 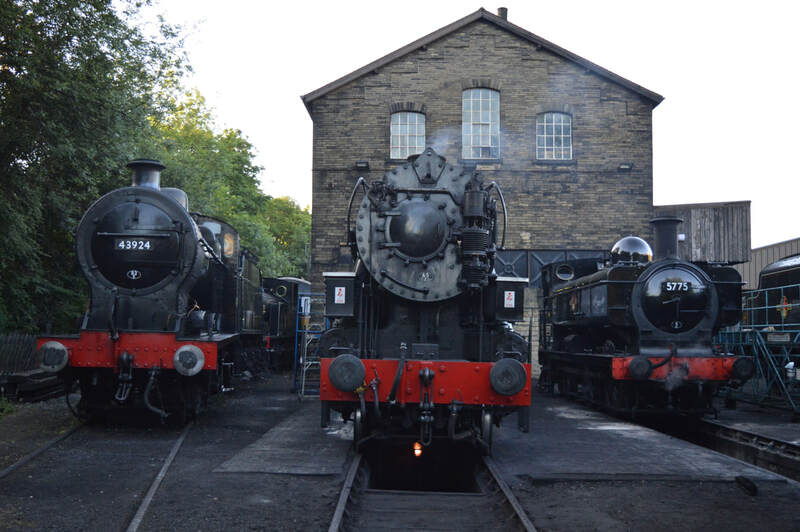 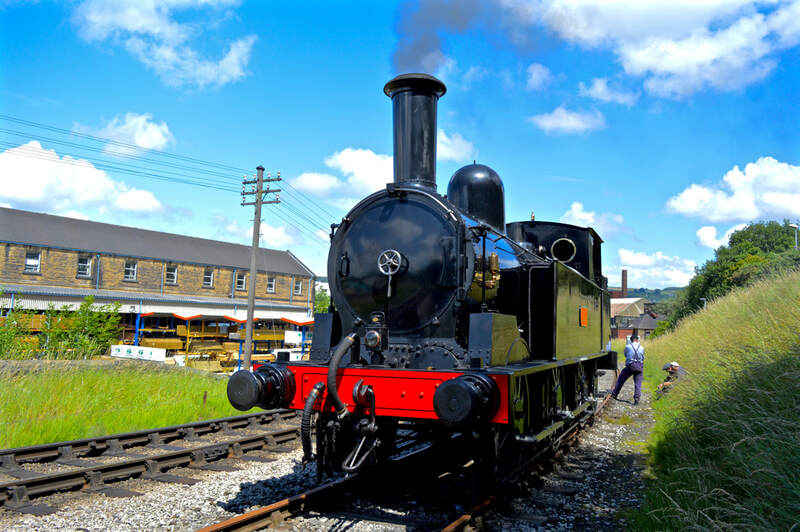 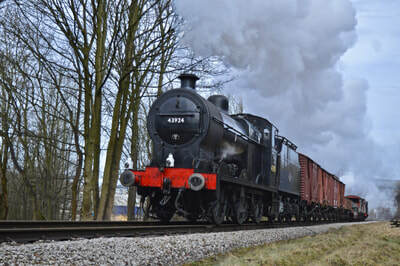 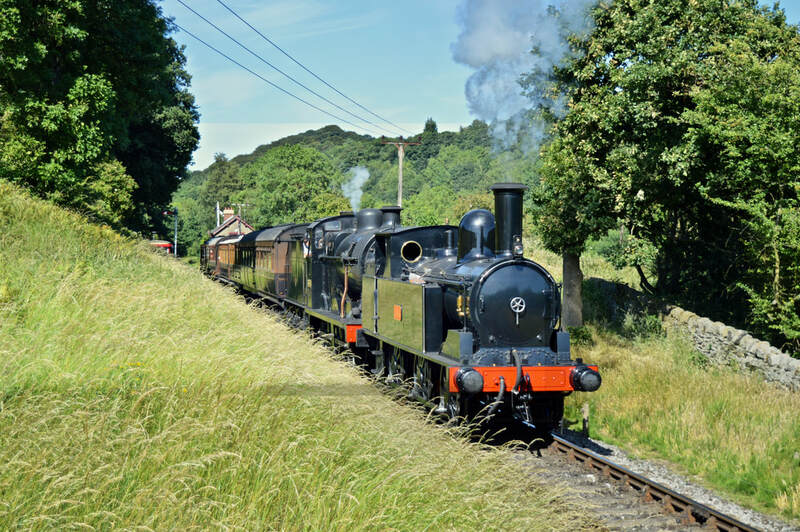 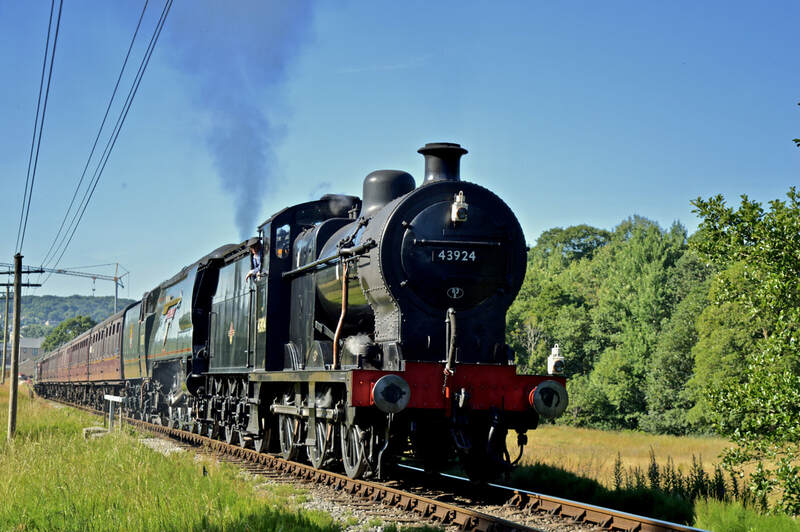 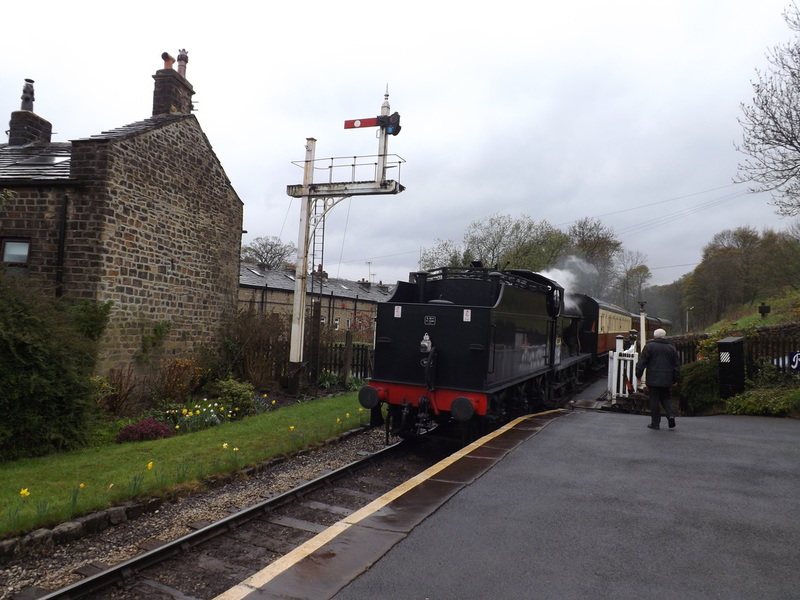 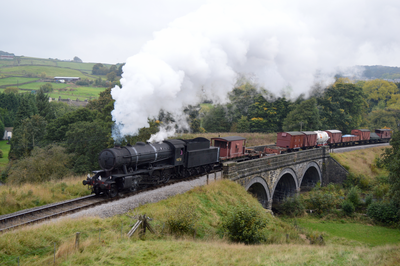 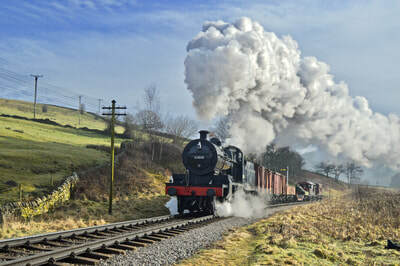 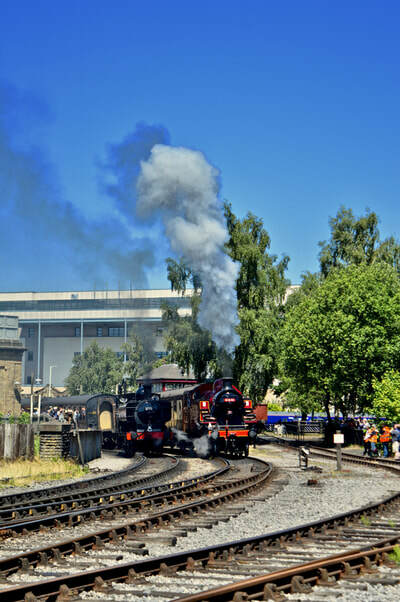 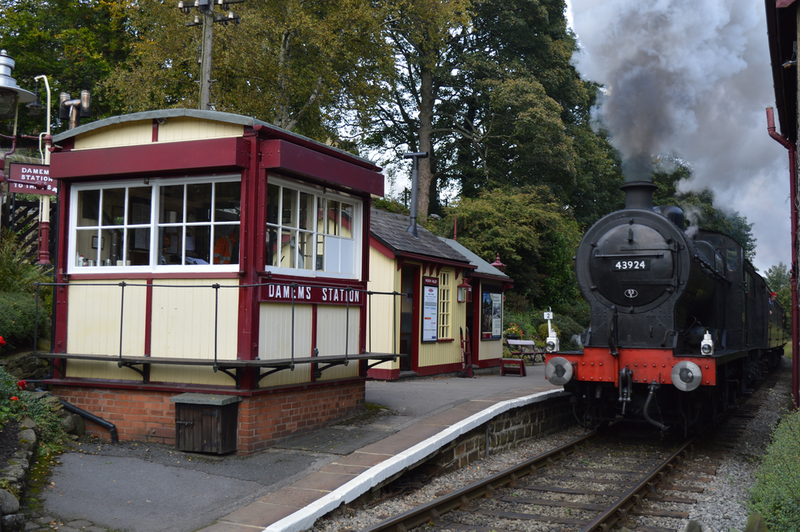 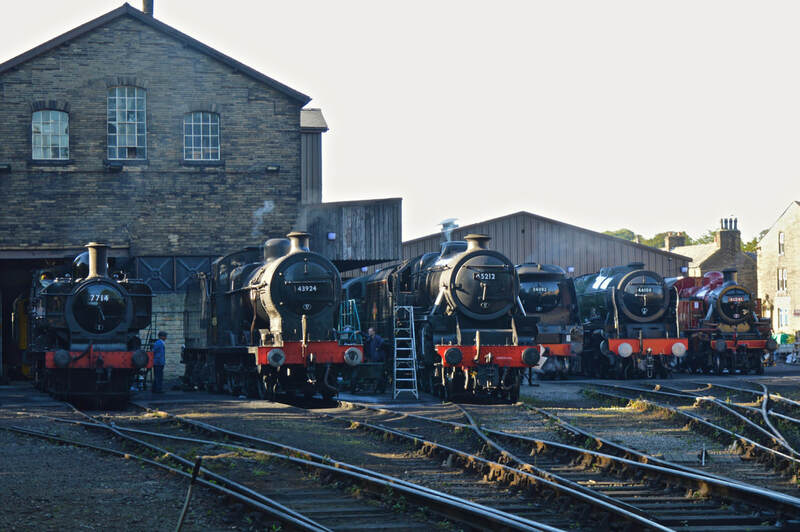 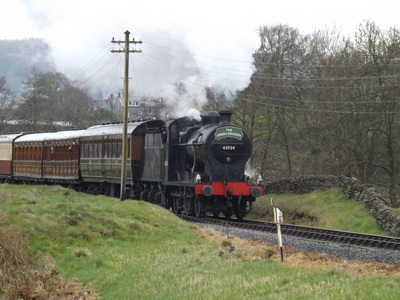 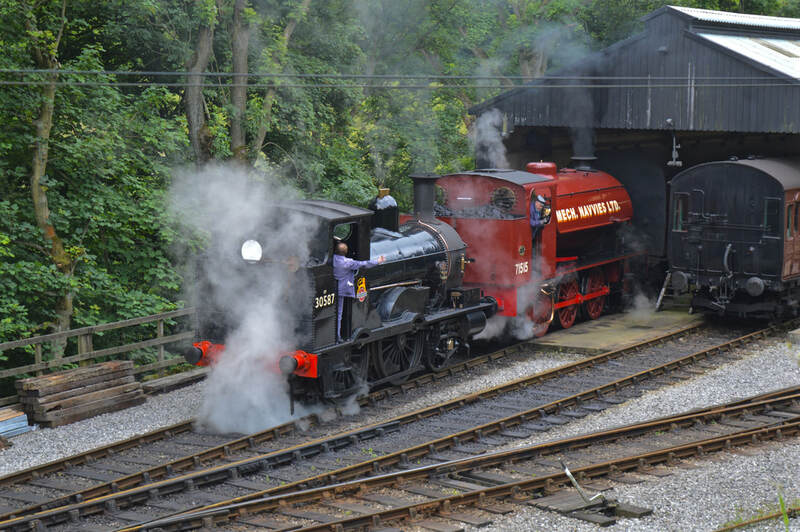 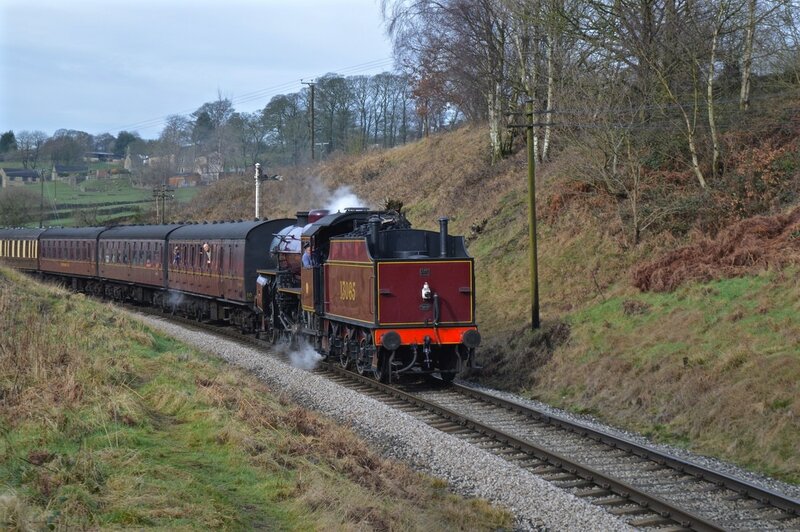 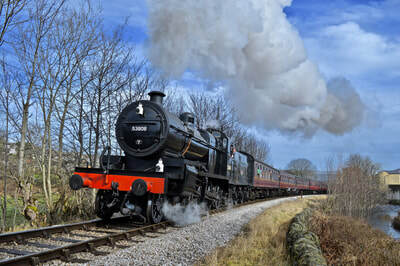 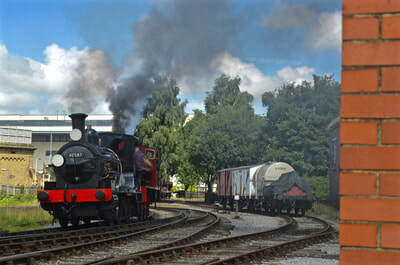 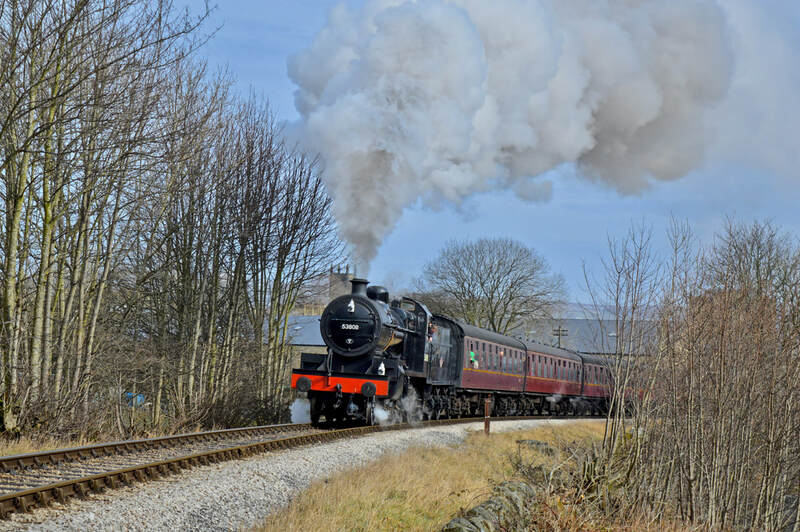 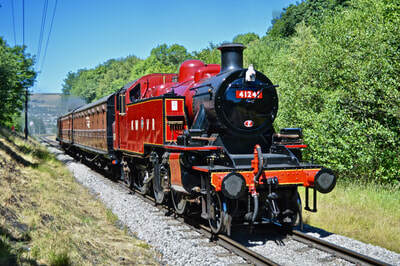 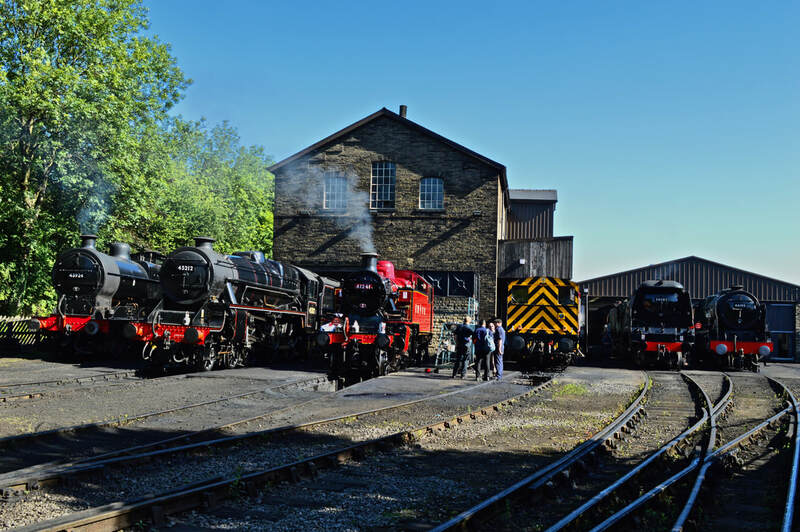 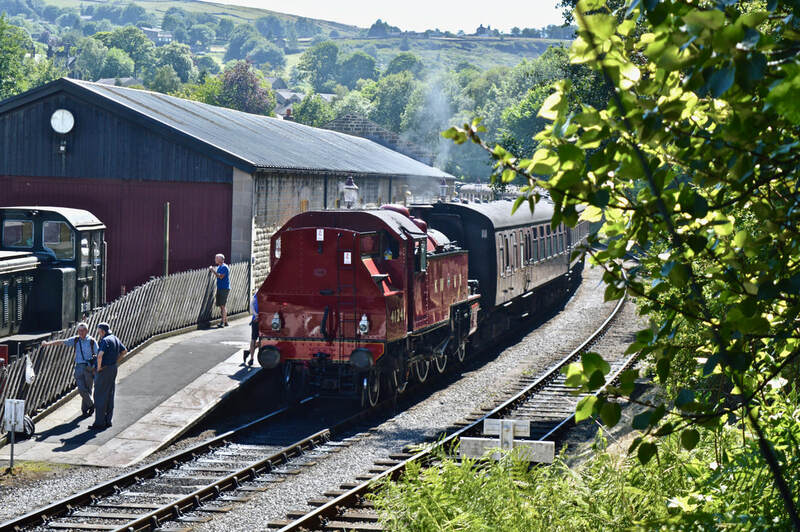 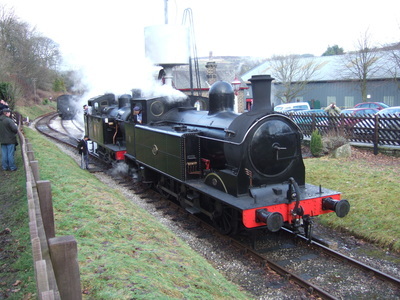 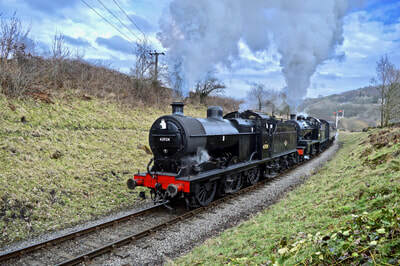 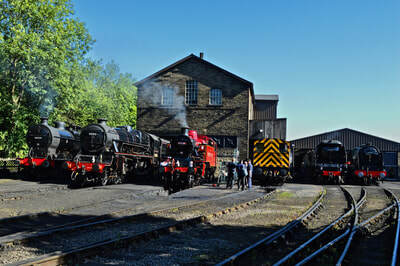 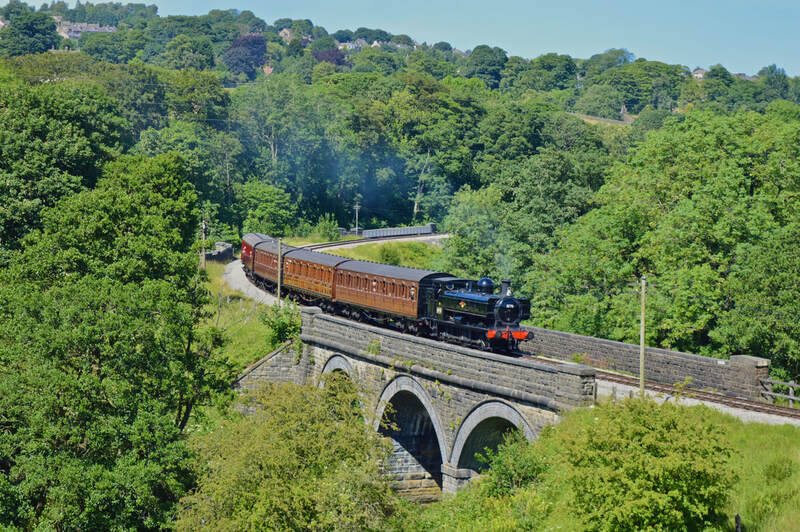 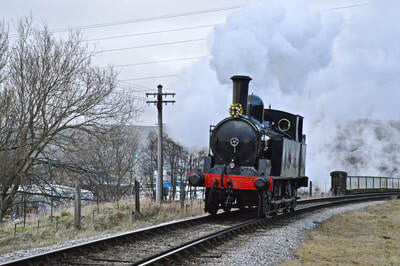 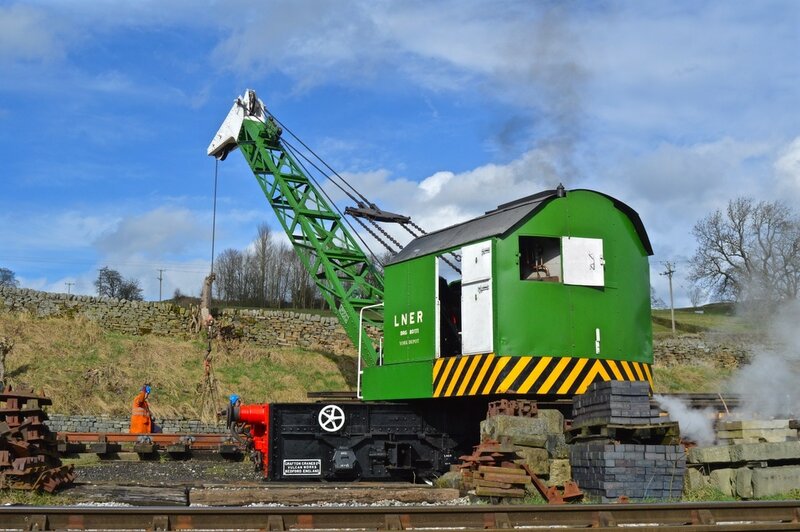 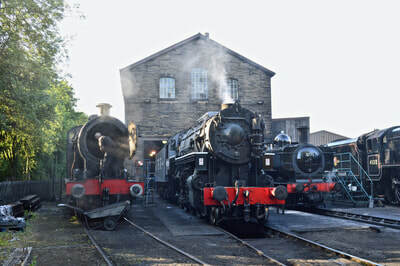 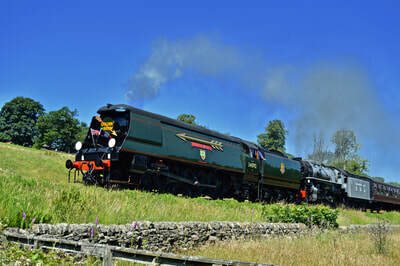 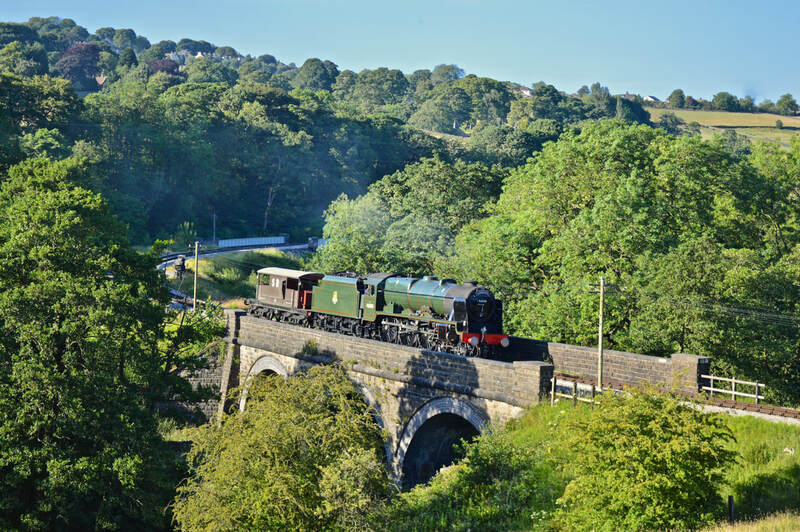 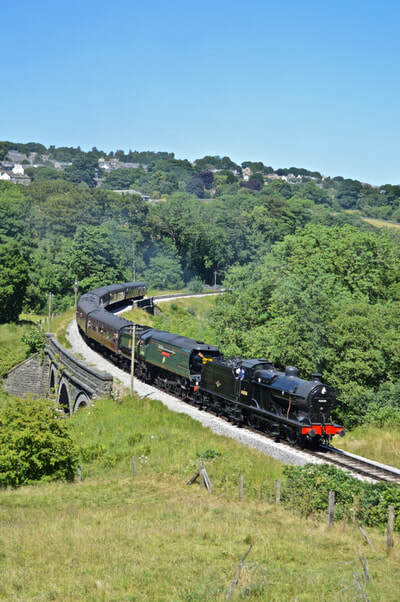 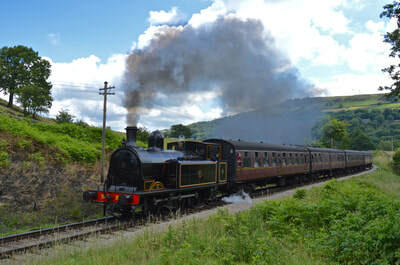 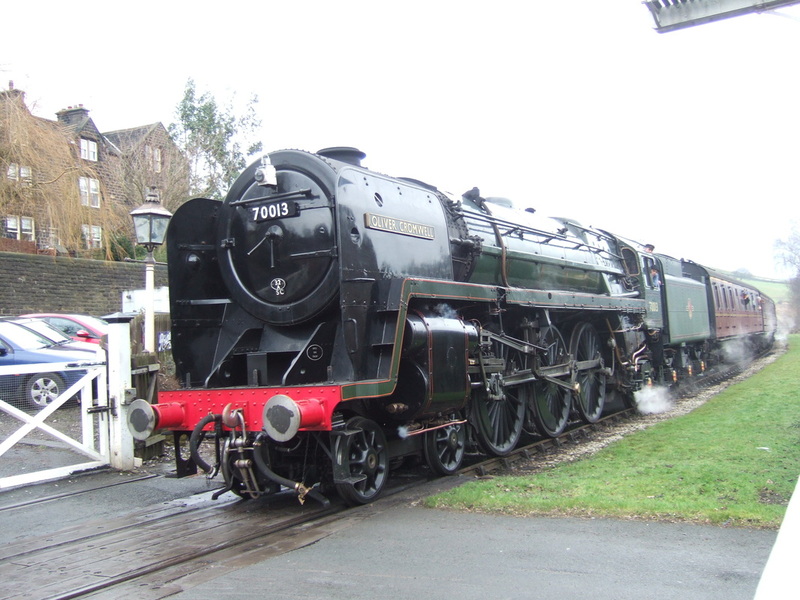 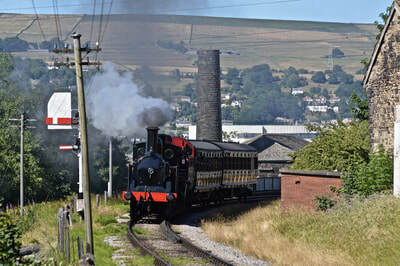 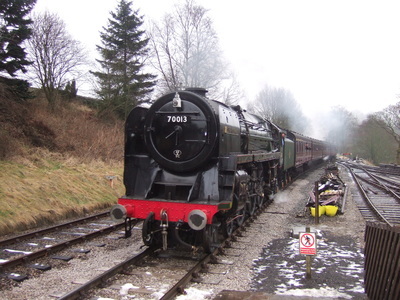 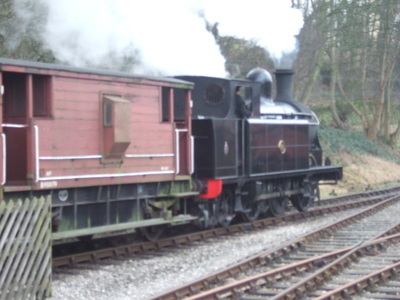 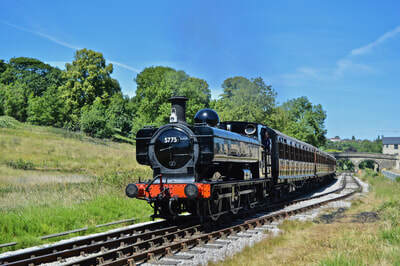 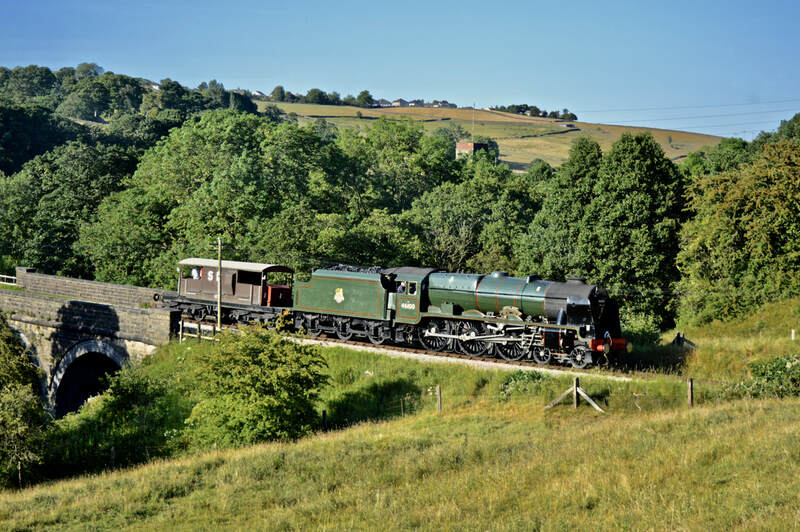 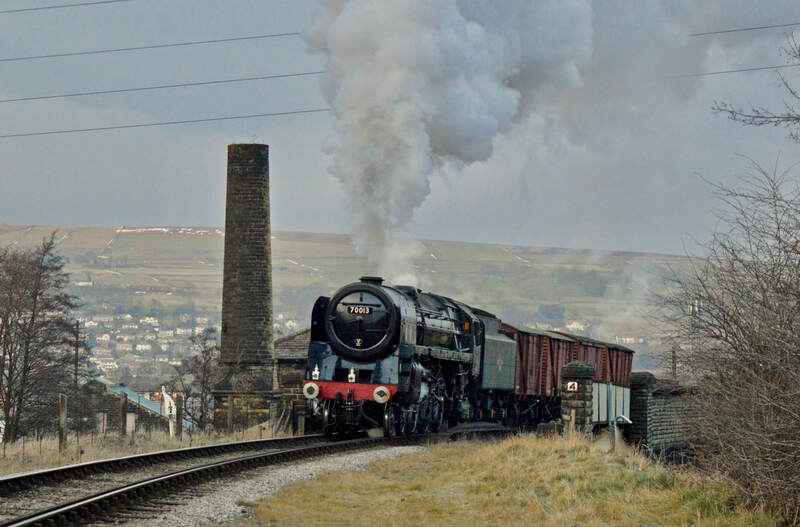 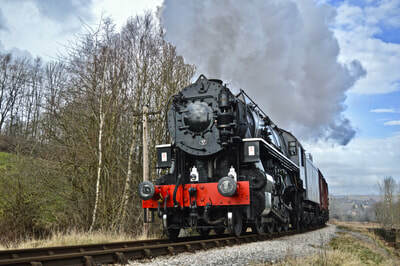 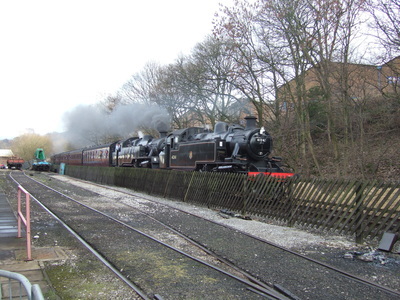 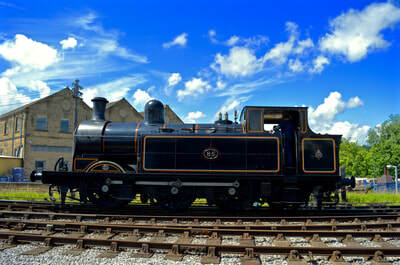 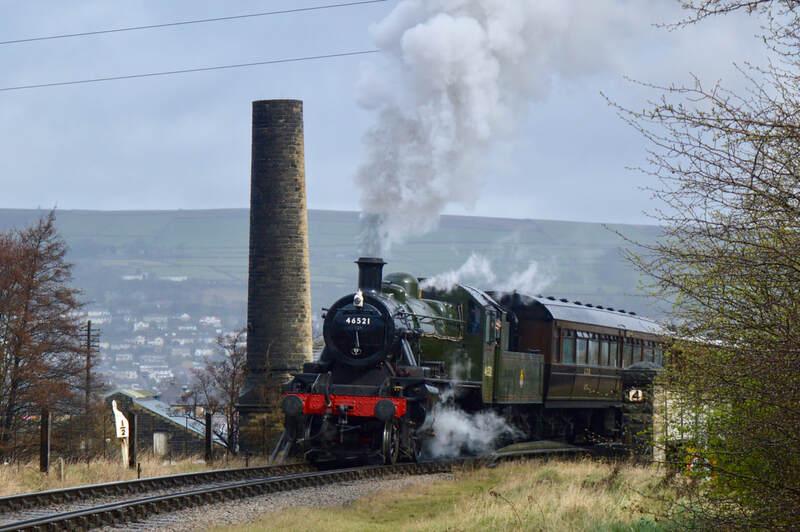 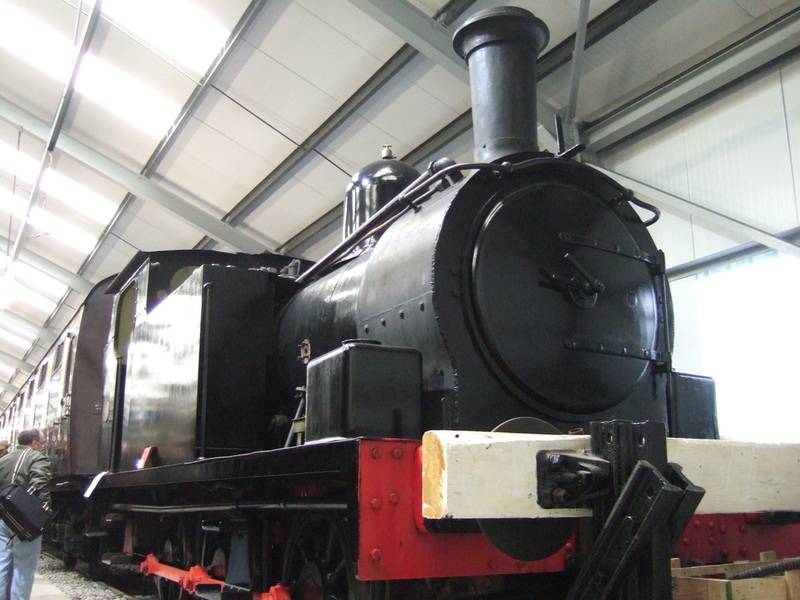 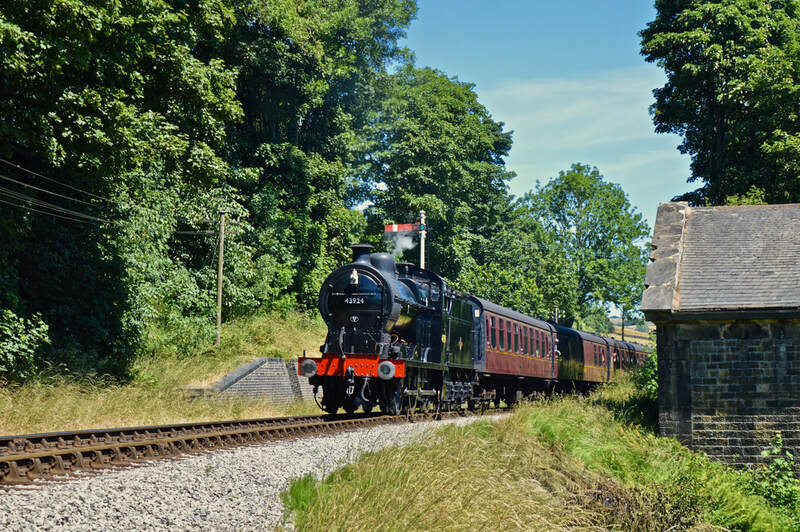 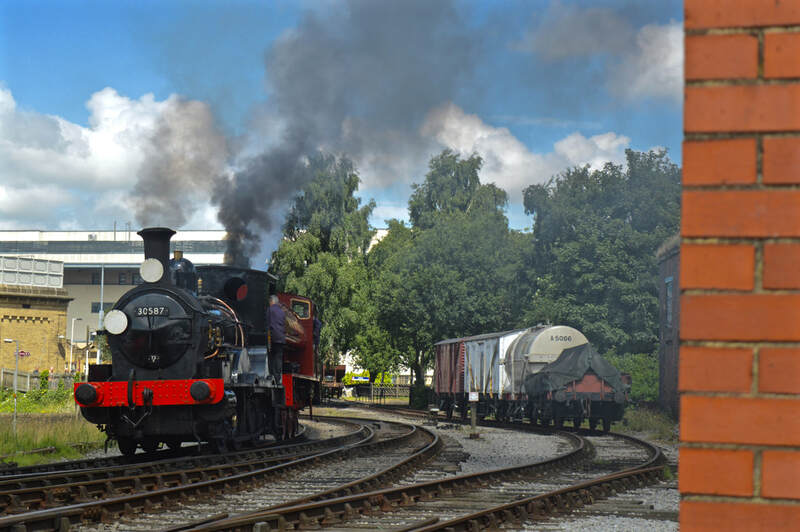 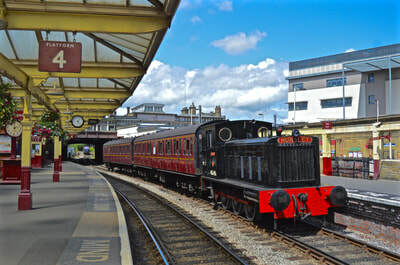 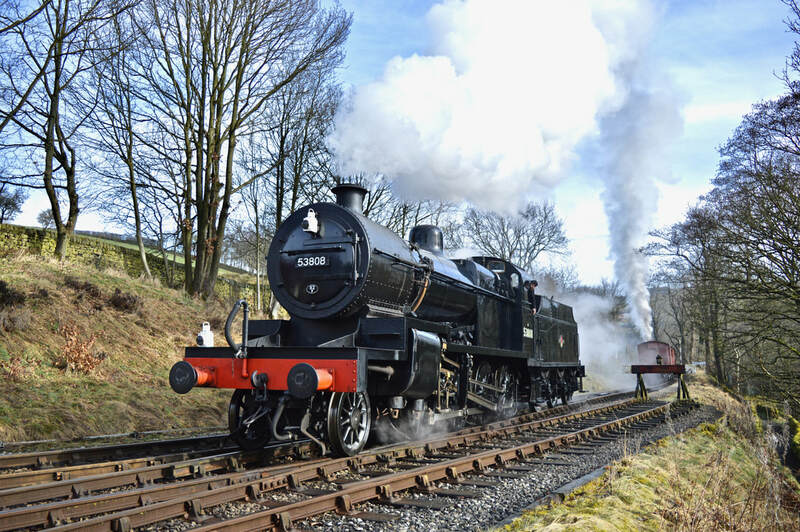 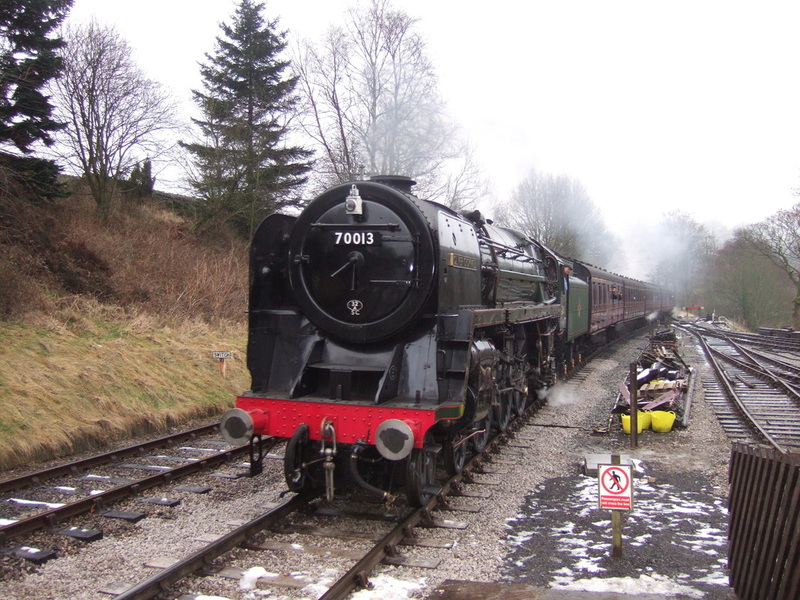 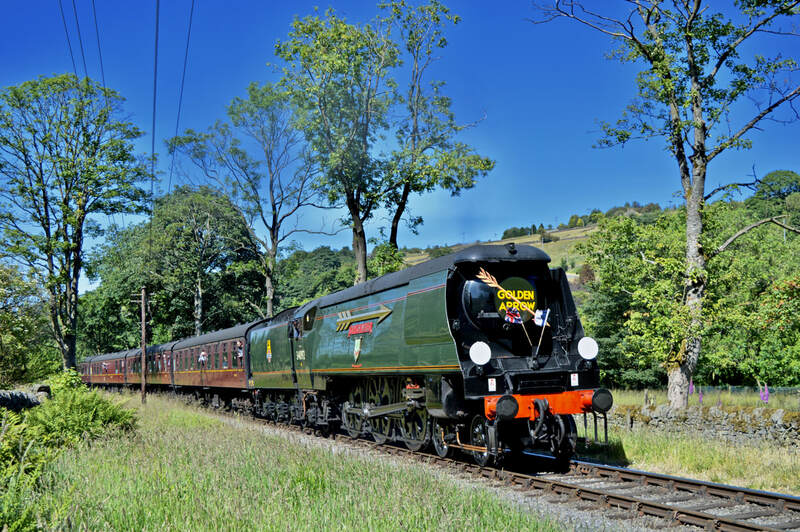 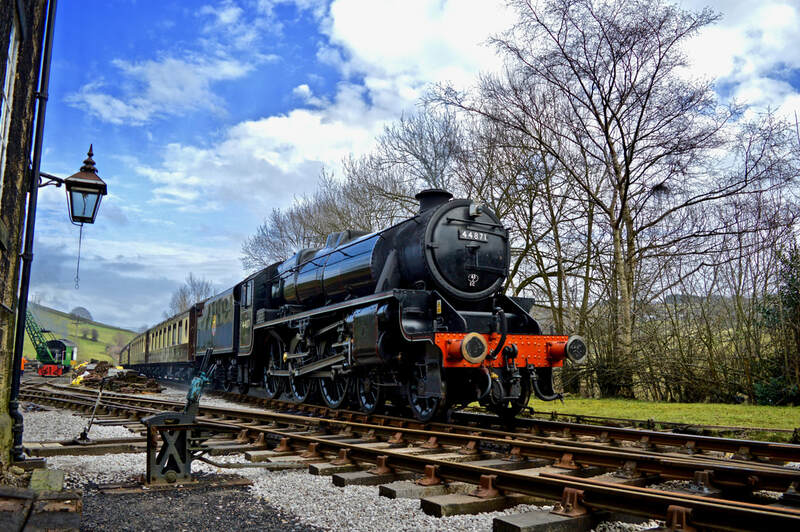 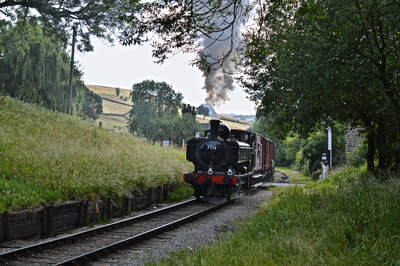 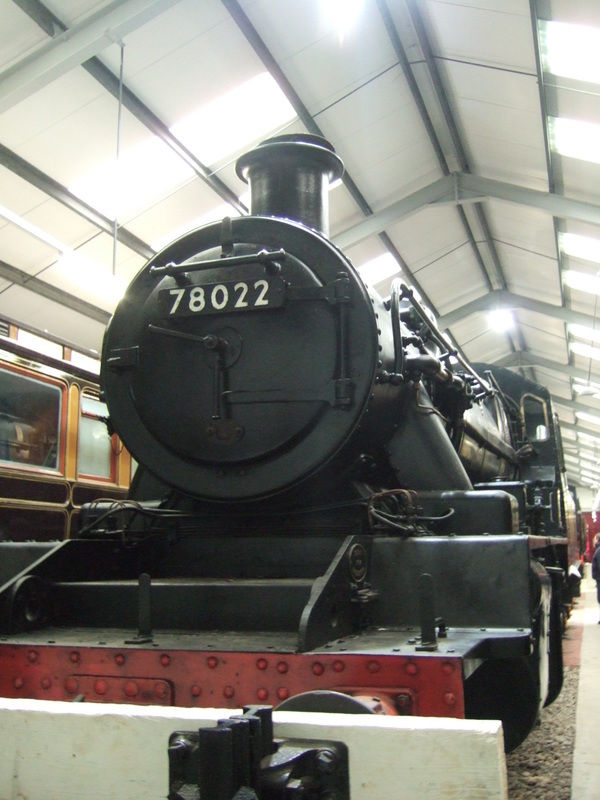 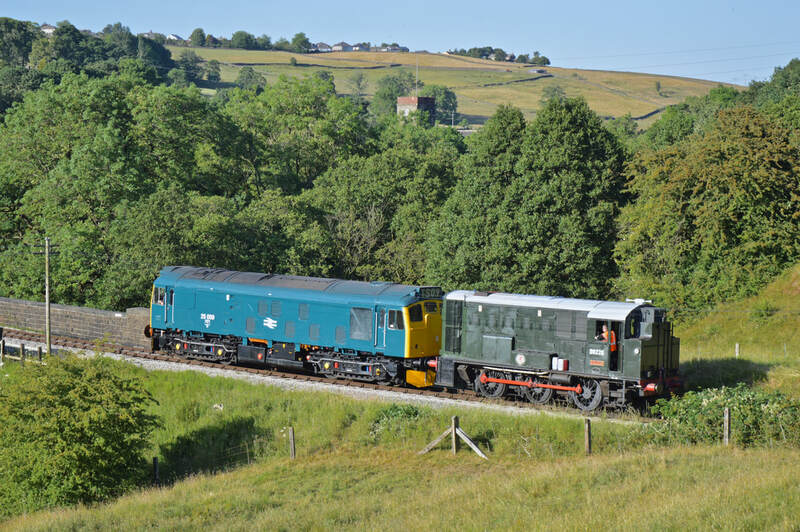 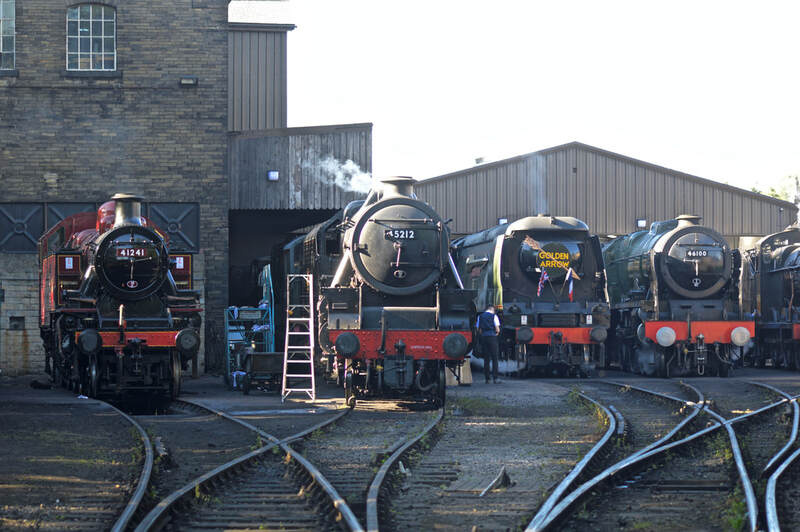 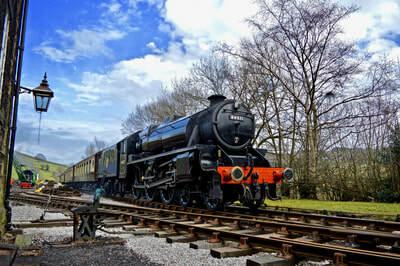 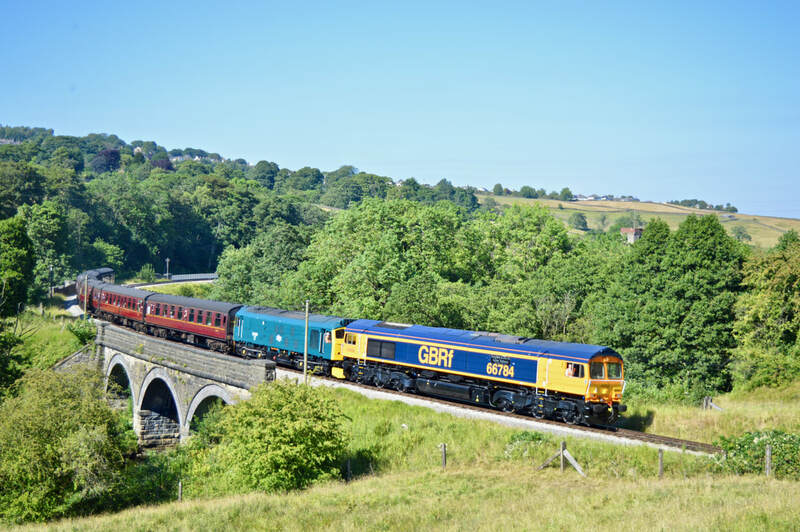 The line offers a complete day out with not only plenty of walks and access to Bronte country, but a series of museums and exhibitions along the line, with the Bahamas Locomotive Society's Shed at Ingrow West, which is also home to the Vintage Carriages Trust with their exhibition and workshops. 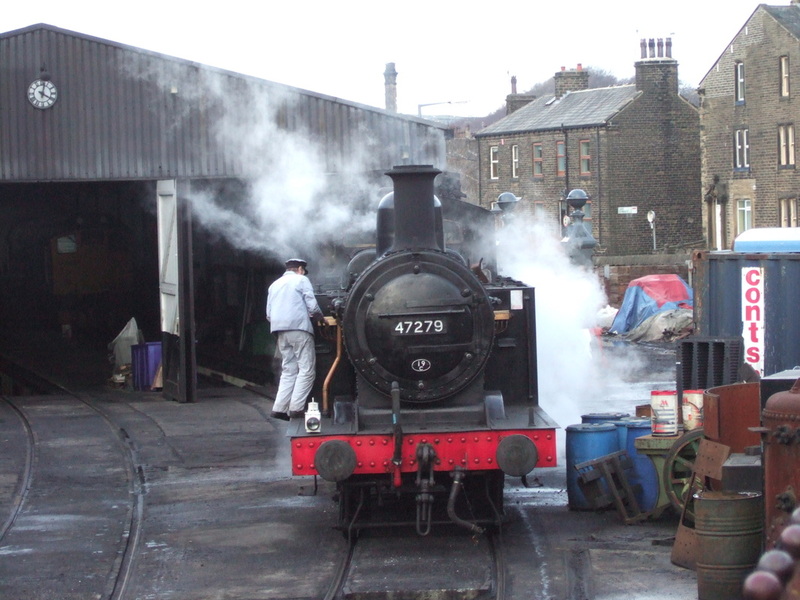 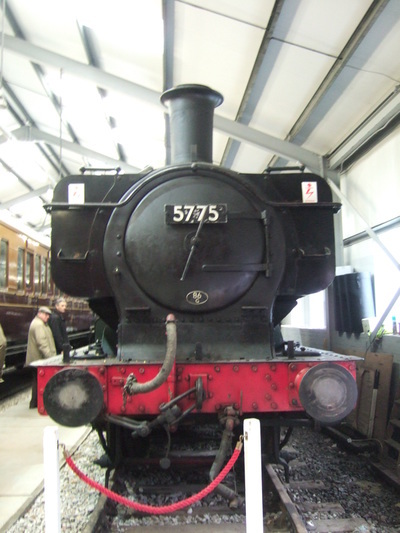 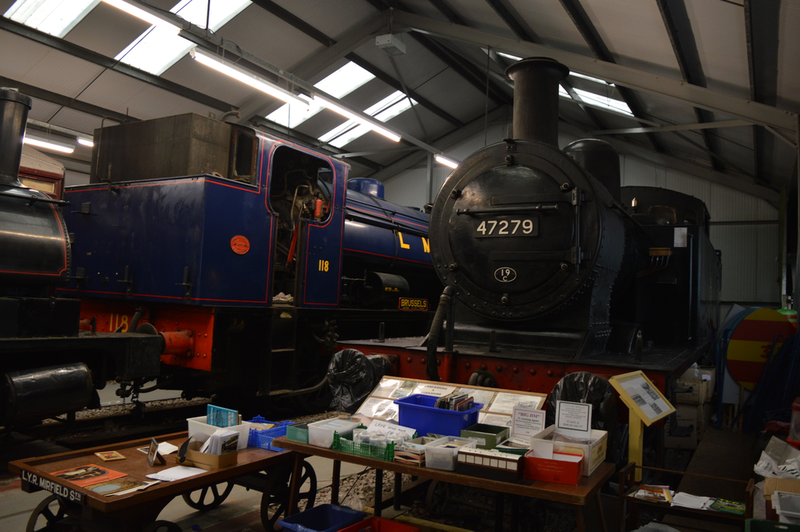 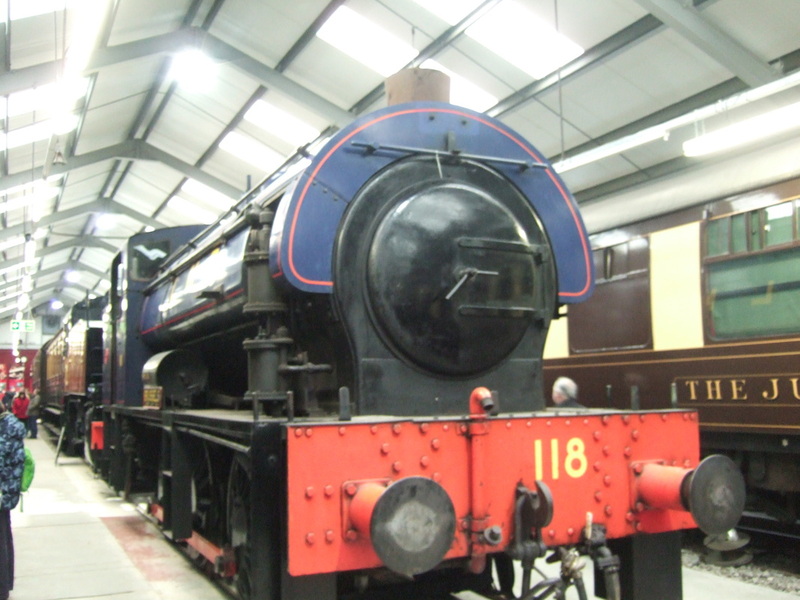 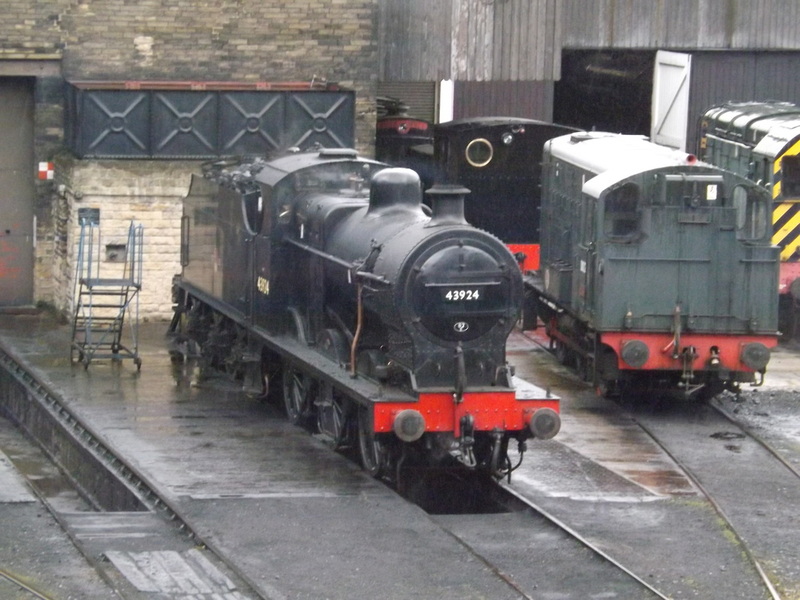 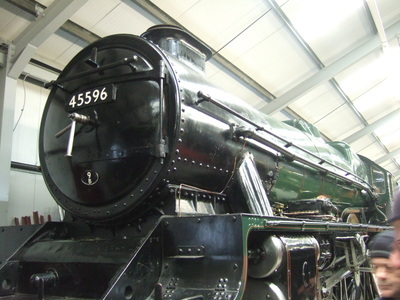 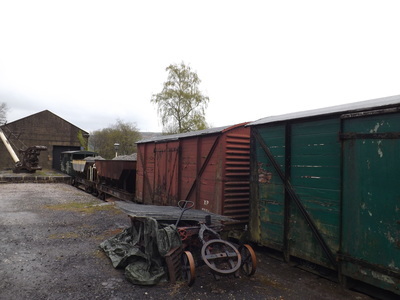 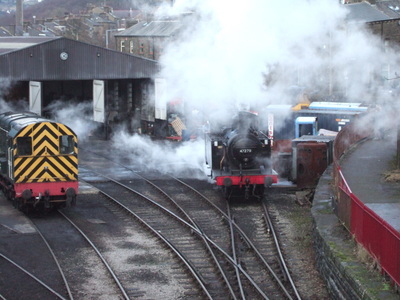 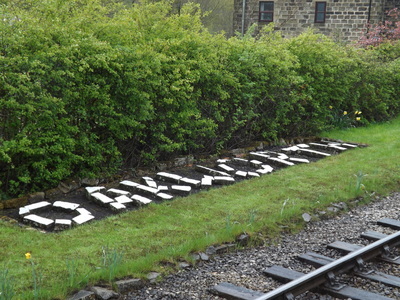 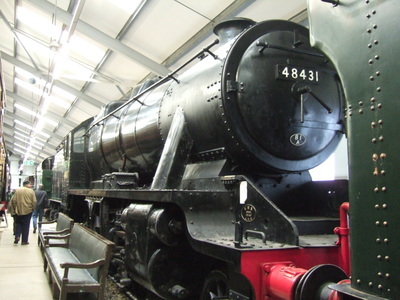 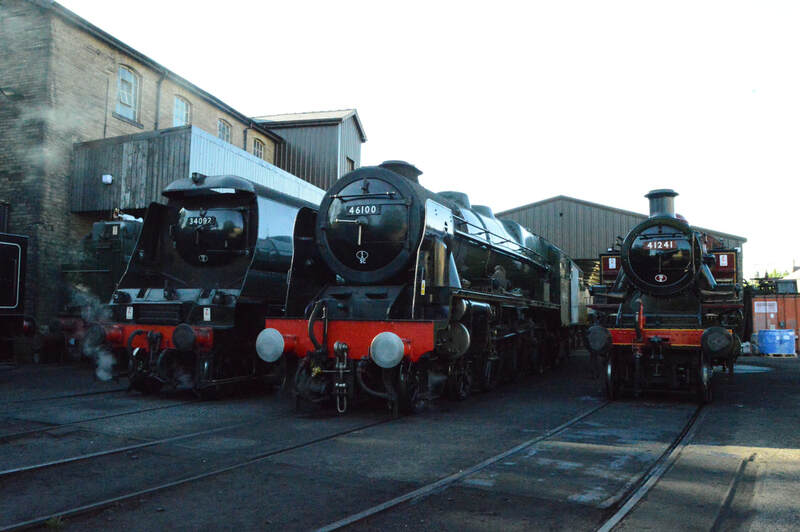 At Oxenhope is an exhibition shed, home to out of service locomotives.